06/30/15 New Nova Series This Fall! There is a new Nova series coming this fall! 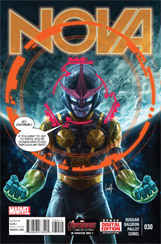 Nova #1 is scheduled to be released following the Secret Wars event. The new series will be written by Sean Ryan (Nova Special #1) with art by Cory Smith. The tagline for the series is "Family Business". 06/25/15 All-New, All-Different Avengers Press Release! The Marvel Universe returns this fall, and at the forefront, a brand new band of Earth's mightiest lead the charge as the premier team of the Marvel Universe. Tony Stark, a.k.a. 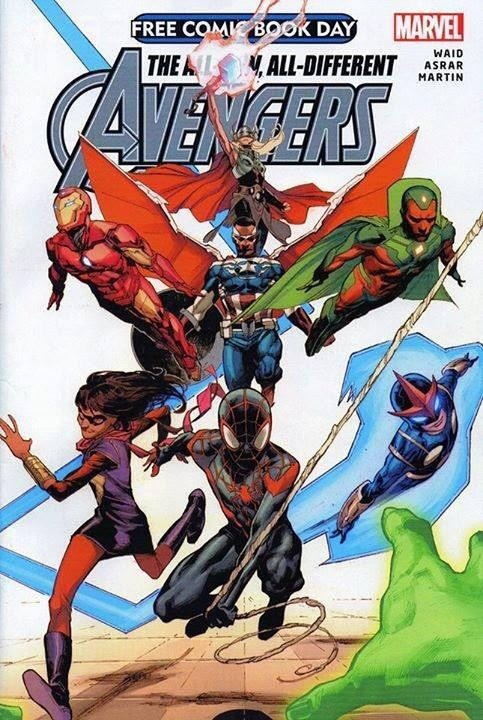 Iron Man, returns to lead an all-new and all-different team Avengers - Captain America (Sam Wilson), Thor (Jane Foster), Vision, and the unlikeliest of heroes - Miles Morales, a.k.a. Spider-Man, Nova, and Ms. Marvel! Today, Marvel is pleased to announce ALL-NEW ALL-DIFFERENT AVENGERS #1 - a new ongoing series from blockbuster writer Mark Waid (Daredevil, S.H.I.E.L.D.) 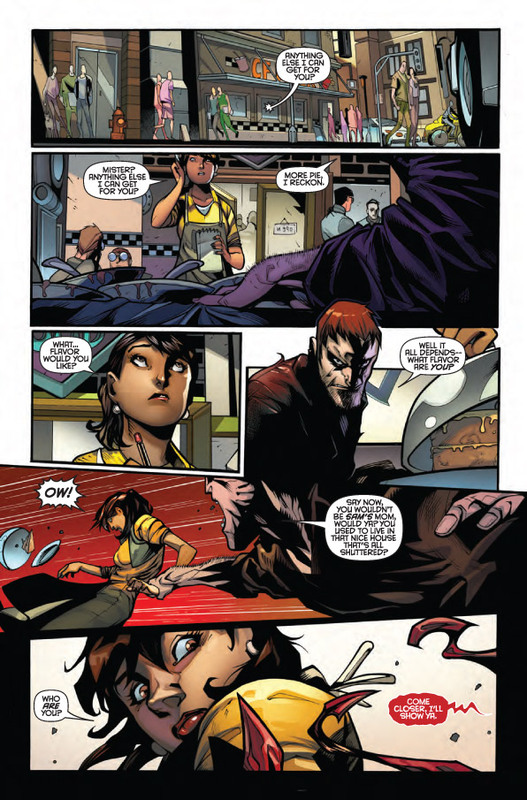 and artistic duties from Adam Kubert (Amazing Spider-Man: Renew Your Vows) and Mahmud Asrar (All-New X-Men). Kicking off the new series, writer Mark Waid plans no training period and a baptismal by chaos and WAR! "As faithful NOVA readers will recognize, the main villain in our first story - Warbringer - has strong ties to Sam Alexander (a.k.a. 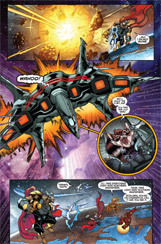 Nova), but does Sam dare confess this to the team after the havoc Warbringer wreaks in New York City?" Waid also plans to place hurdle after hurdle in front of this new team including a challenge a majority of people have to deal with every day - financial responsibility. "One of the Avengers' often-undiscussed 'superpowers' has always been Tony Stark's boundless fortune. As readers of Brian Bendis's upcoming INVINCIBLE IRON MAN will see, Tony can no longer be the team's sole financial resource - meaning that our Avengers will have to operate a little more modestly and with limits to their resources, making their battles even more challenging." The Avengers assemble this fall for a team that will truly live up to the name the series title implicitly states that is all-new, all-different, and like no other Avengers team ever. 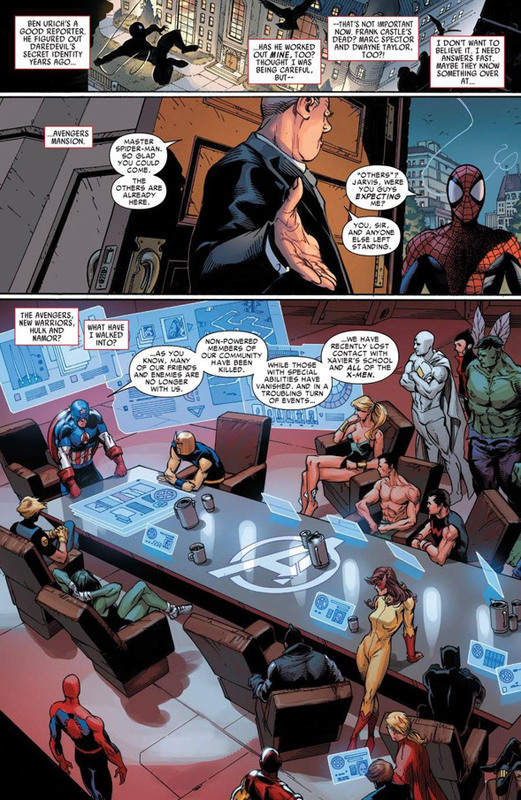 "This team is a group of characters that you've never seen operate together before, no matter how long you may have been reading comics, and yet it's also a team that upholds the Avengers' traditions - there's nobody among these characters that you look at and feel hasn't earned their place on the team or in the spotlight, the way some past Avengers occasionally have," says Marvel Executive Editor Tom Brevoort. "And it's possibly the most real-world reflective Avengers team of all time, with only a single white male to be found amidst the membership rolls." The Avengers assemble this fall as the Marvel's mightiest take on all-new foes, all-new challenges and present an all-new team in ALL-NEW ALL-DIFFERENT AVENGERS #1! 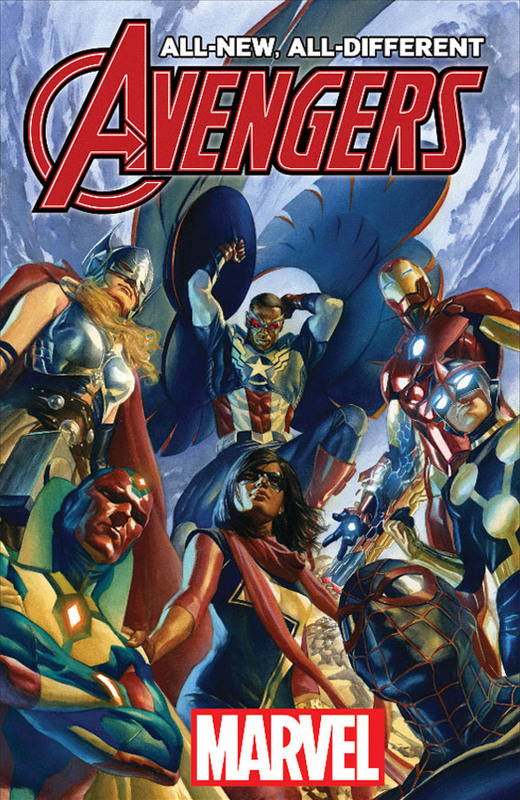 06/24/15 Promo Art Of All-New, All-Different Avengers! Marvel has released promotional art of the All-New, All-Different Avengers team. The series will be written by Mark Waid with art by Mahmud Asrar and Adam Kubert. 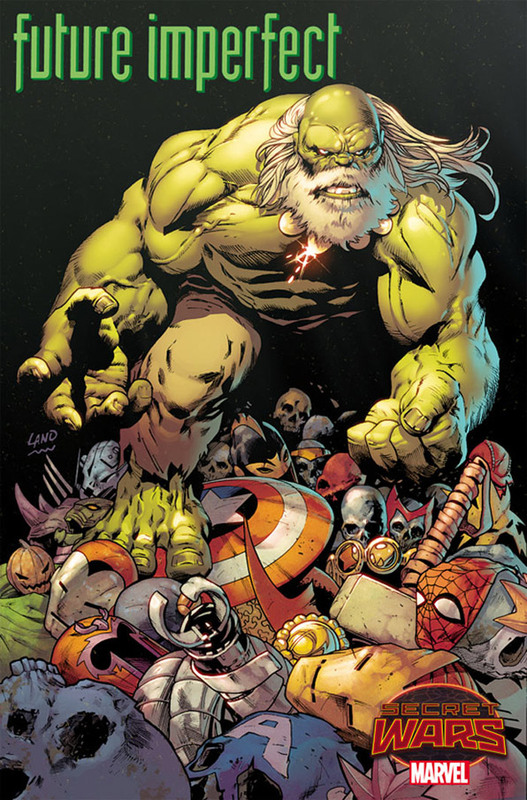 The All-New, All-Different Avengers is scheduled to ship more than twelve issues a year. The series will debut in the fall with the team fighting Sam Alexander Nova's Chitauri foe Warbringer. 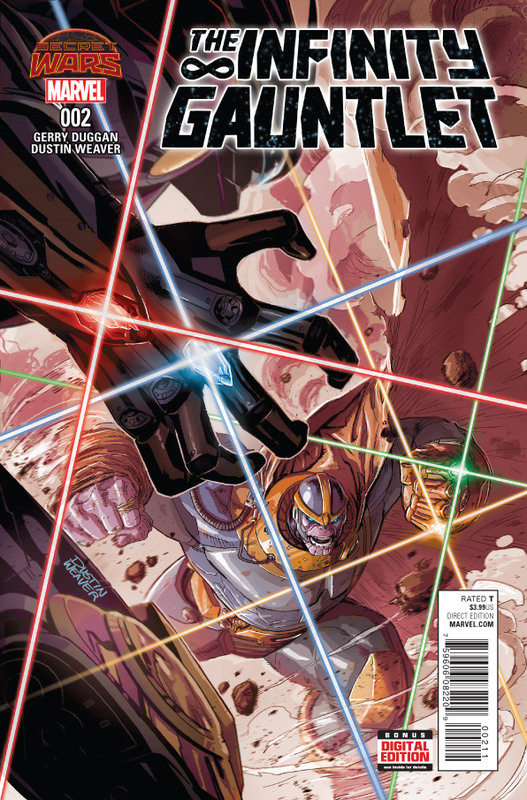 06/19/15 Infinity Gauntlet #2 Covers & Preview Pages! 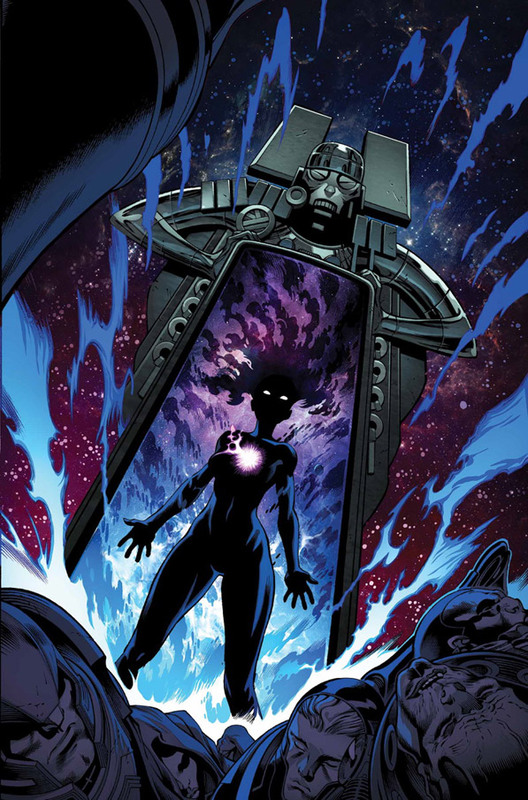 Marvel has released the covers and preview pages from Infinity Gauntlet #2! The issue is written by Dustin Weaver & Gerry Duggan with art by Dustin Weaver. 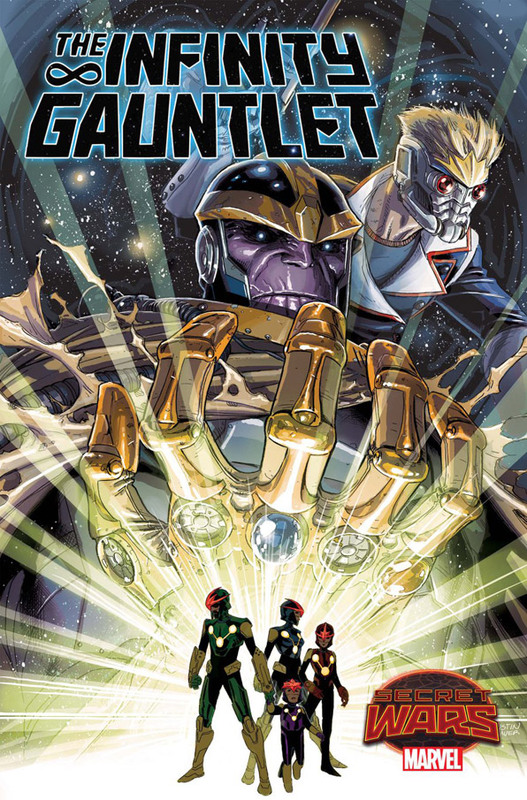 Infinity Gauntlet #2 is scheduled to be released on June 24th. 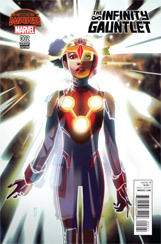 06/19/15 A Nova On Cover To Secret Wars #7! An alternate universe version of a female Nova appears on the cover of Secret Wars #7! The cover art is by Alex Ross. 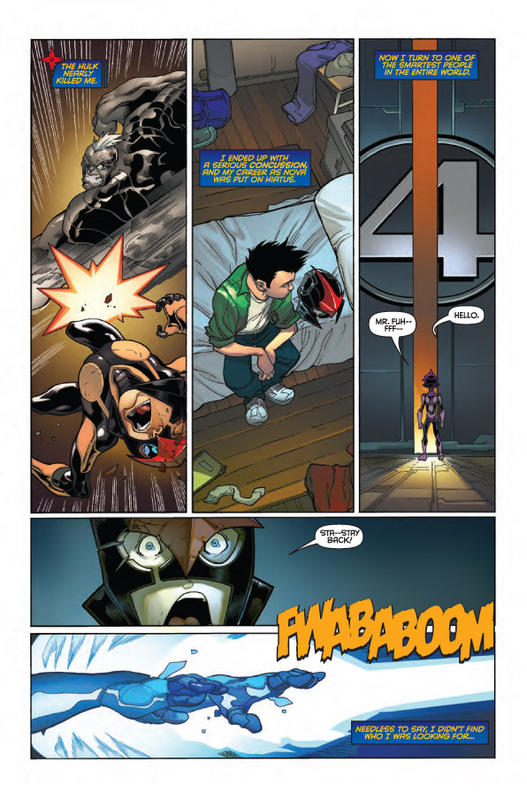 Secret Wars #7 is scheduled to be released on September 7th. Infinity Gauntlet #1 came in at #13 with a sales estimate of 95,131! Nova #31 came in at #128 with a sales estimate of 18,129! 06/04/15 Nova in Spider-Man: Renew Your Vows #1! 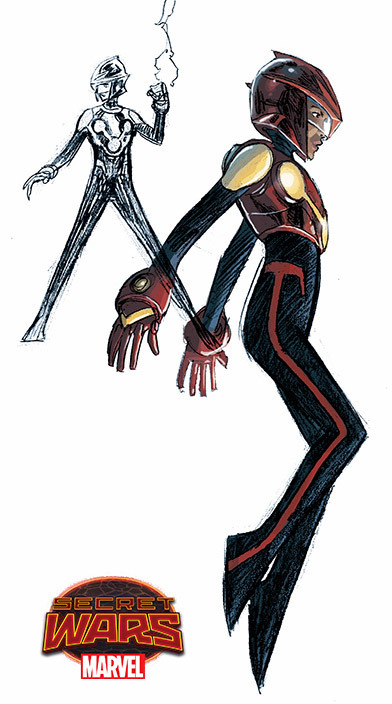 An alternate universe version of Rich Rider as Nova appears in Amazing Spider-Man: Renew Your Vows #1! The issue is written by Dan Slott with art by Adam Kubert. Amazing Spider-Man: Renew Your Vows #1 went on sale June 3rd. Black Vortex: Omega #1 came in at #28 with a sales estimate of 55,955! Nova #30 came in at #159 with a sales estimate of 18,635! Nova #29 came in at #161 with a sales estimate of 18,228! 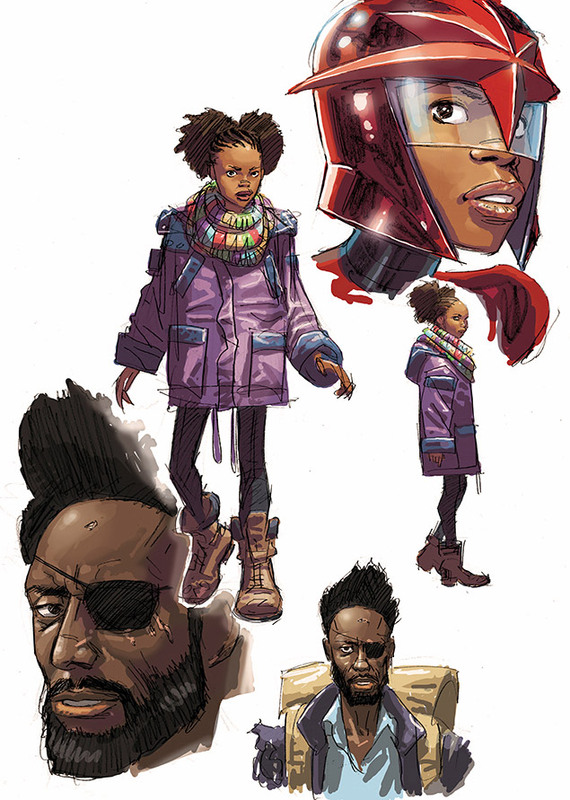 05/28/15 Nova In Marvel Fact Files #91! The United Kingdom's Eaglemoss Collections will be including Sam Alexander Nova in Marvel Fact Files #91! 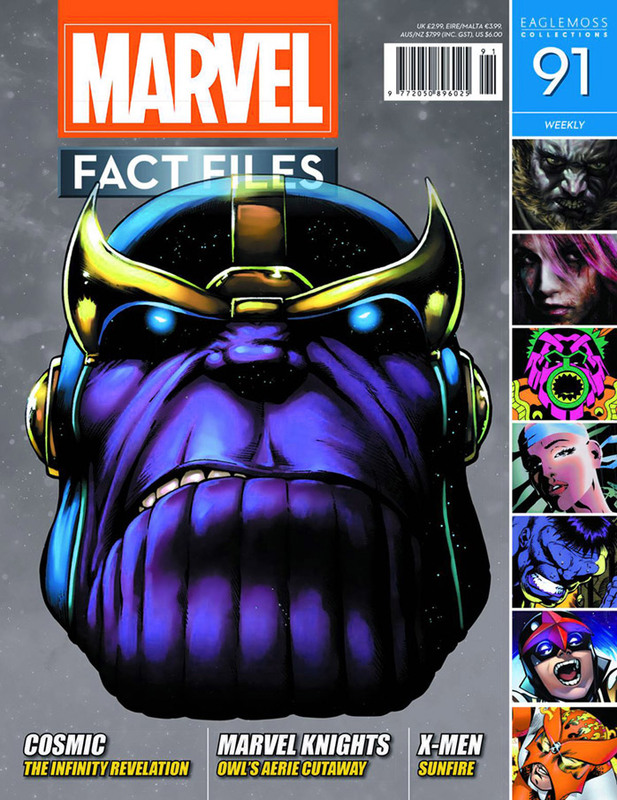 Marvel Fact Files is a weekly publication featuring in-depth looks at various Marvel characters. #91 is schedule to be released in the United States on October 28th. 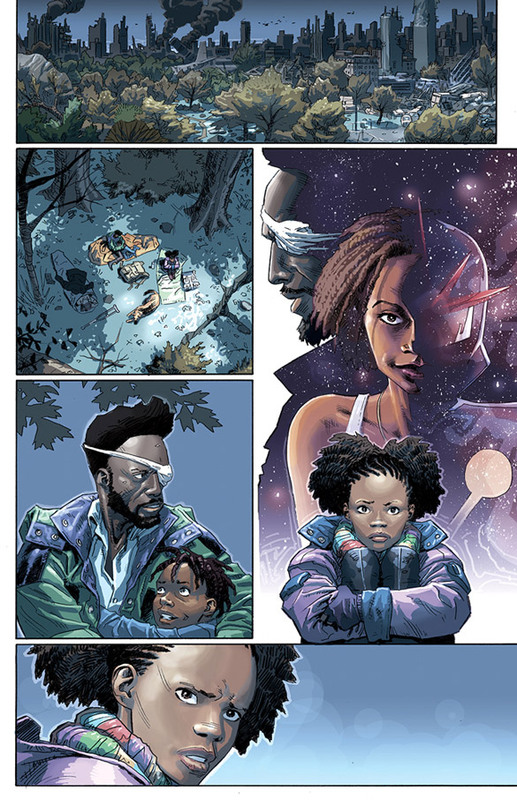 05/22/15 Nova #31 Cover & Preview Pages! 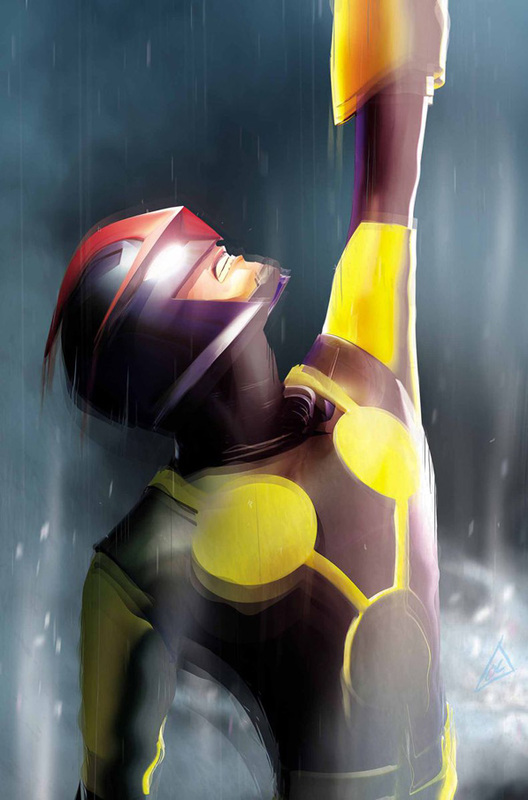 Marvel has released the cover and preview pages from Nova #31! 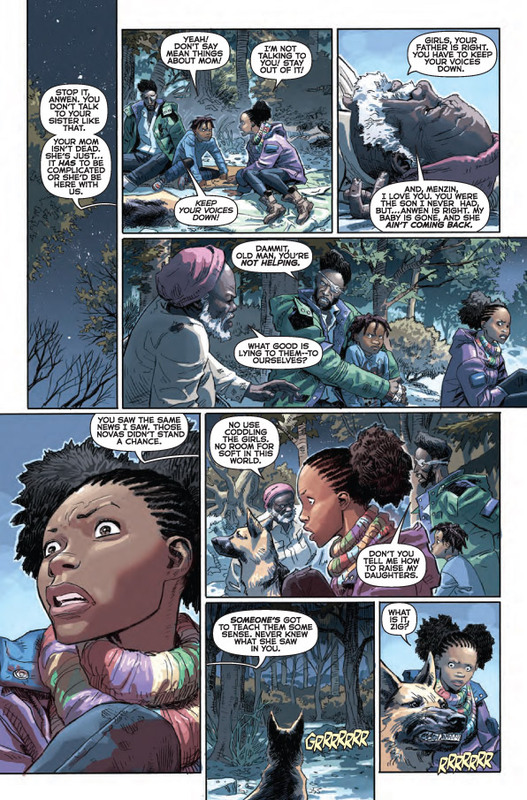 The issue is written by Gerry Duggan with art by David Baldeon. Nova #31 is scheduled to be released on May 27th. 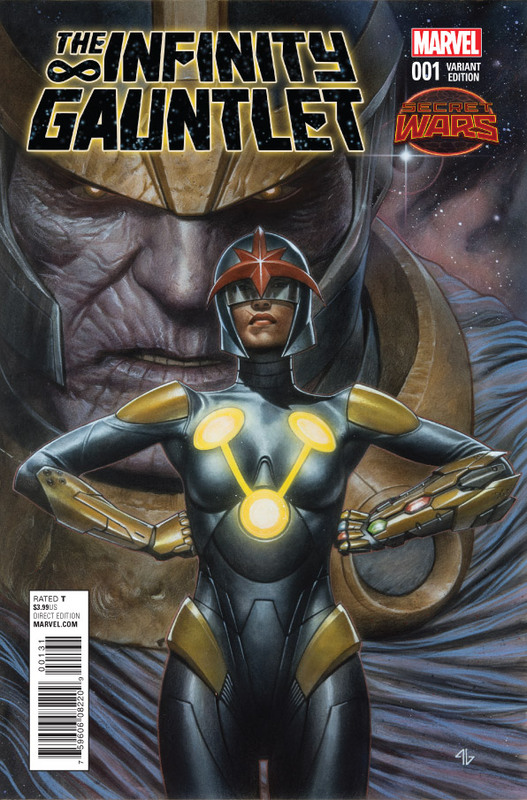 05/22/15 Infinity Gauntlet #1 Covers & Preview Pages! 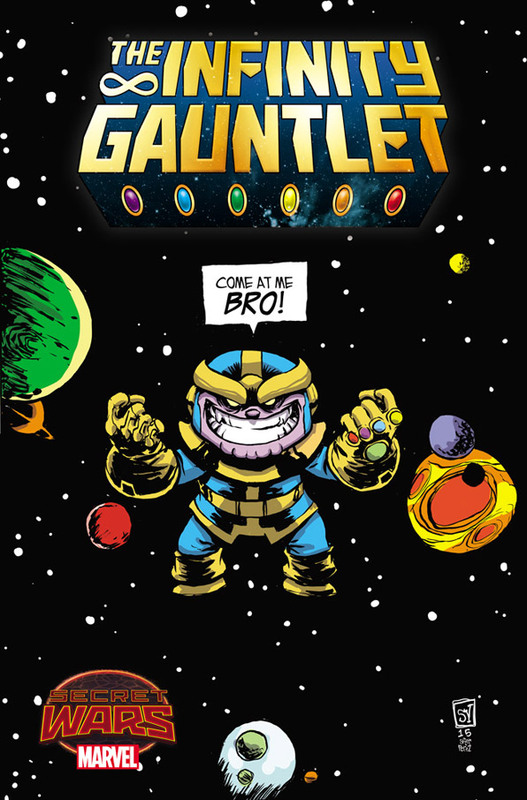 Marvel has released the covers and preview pages from Infinity Gauntlet #1! 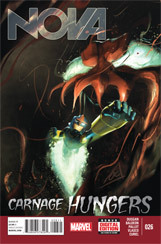 The issue is written by Gerry Duggan & Dustin Weaver with art by Dustin Weaver. 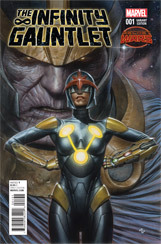 Infinity Gauntlet #1 is scheduled to be released on May 27th. 05/19/15 Infinity Gauntlet #4 Solicitation! It's all-out war for the Infinity Stones with the Bakian family at the center of it. 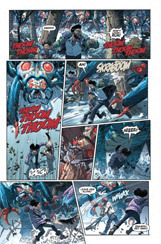 The fate of Battleworld hangs in the balance, but so does the fate of one family that has been torn apart. Nova #28 came in at #75 with a sales estimate of 29,175! 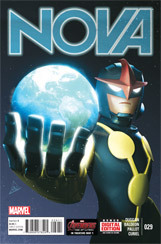 Nova Annual #1 came in at #120 with a sales estimate of 18,776! 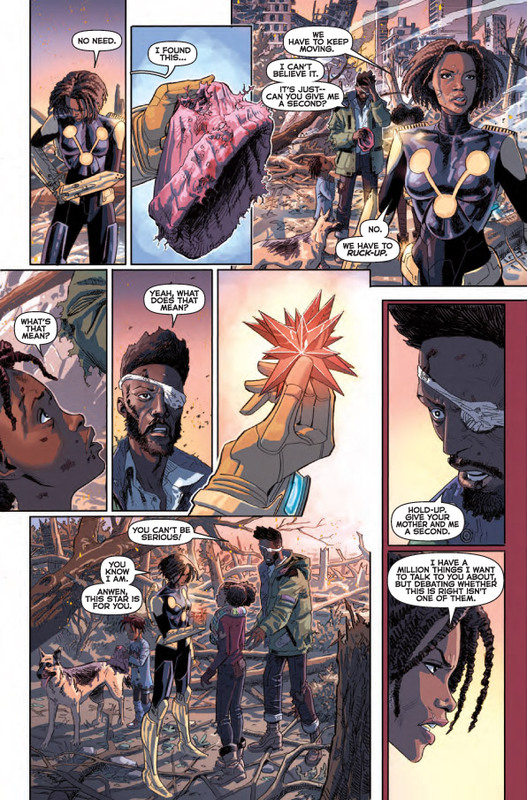 04/30/15 Infinity Gauntlet #1 Press Release! The stones are calling to one another, and the most powerful artifact in the Marvel Universe will be re-assembled in INFINITY GAUNTLET #1! 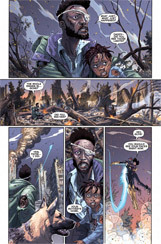 From blockbuster creators Gerry Duggan (Deadpool, Nova) and Dustin Weaver (Edge of Spider-Verse) comes an explosive cosmic tale of life, death, family and the things we do for survival. 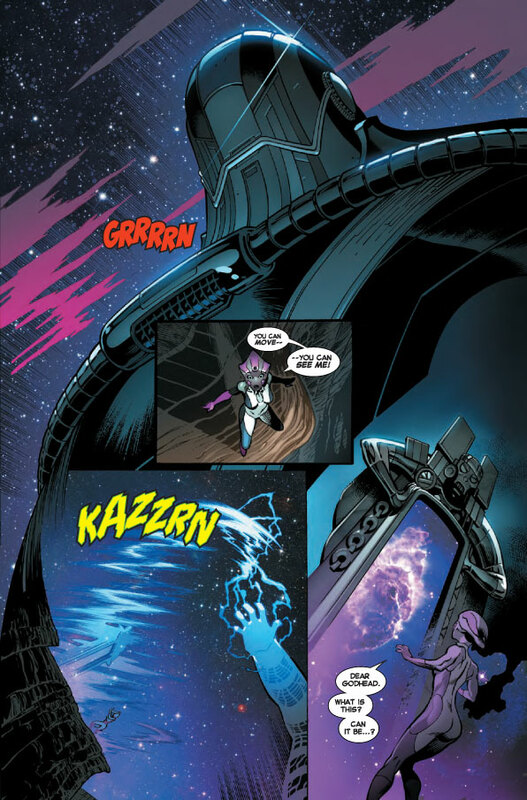 Welcome to New Xandar to the south of Battleworld. Once a beautiful city-state, an invasion from a neighboring zone has left it a barren post-apocalyptic mess. In this hellish wasteland, Anwen Bakian and her family struggle and claw to survive. Mom left years ago to join the Nova Force, only she never came back. 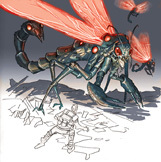 Now it's just Anwen, her dad, sister and grandfather - all alone in a realm dominated by giant killer insects. Until she finds a mysterious stone that may or may not unlocks incredible cosmic power! Only, now she'll find herself begin hunted by those who seek the stone for their own - including the madman known as Thanos! Witness the beginning of a hero's journey as a Duggan and Weaver flip the cosmic side of the Marvel Universe on its ear when the gauntlet is thrown in INFINITY GAUNTLET #1 - coming to comic shops and digital devices this May! 04/24/15 Nova #30 Cover & Preview Pages! 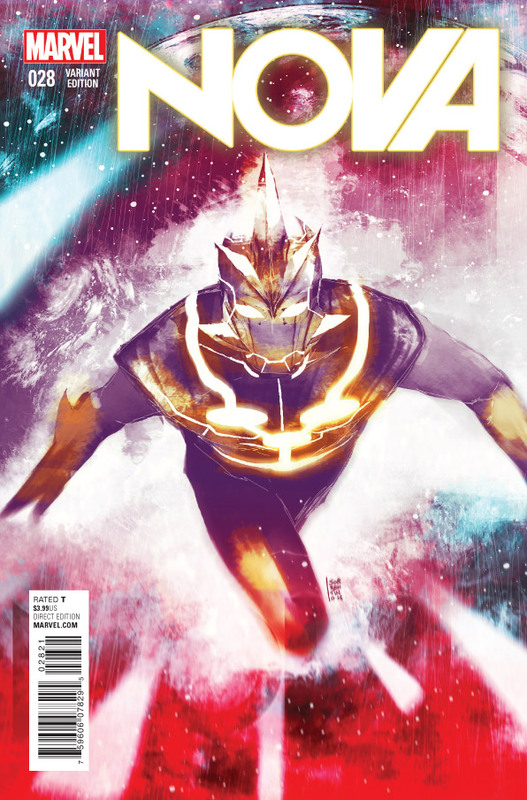 Marvel has released the cover and preview pages from Nova #30! 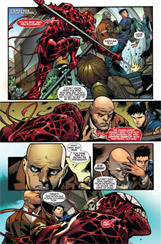 The issue is written by Gerry Duggan with art by David Baldeon. 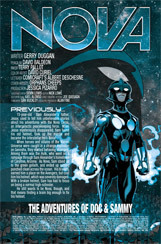 Nova #30 is scheduled to be released on April 29th. 04/21/15 Infinity Gauntlet #3 Solicitation! The search for the Infinity Stones continues. The family finds themselves allied with Thanos. Don't they know Thanos can't be trusted? No. Someone please tell them! 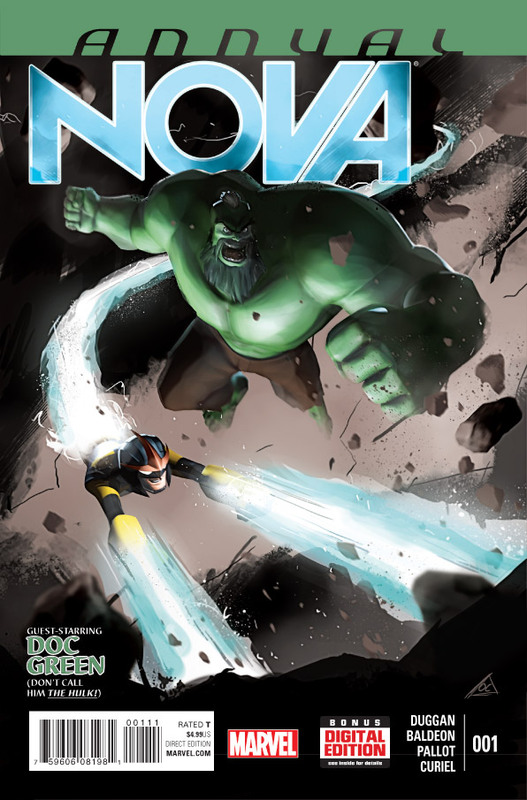 04/10/15 Nova #29 Cover & Preview Pages! 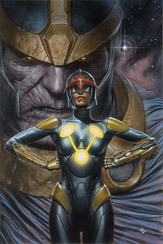 Marvel has released the cover and preview pages from Nova #29! 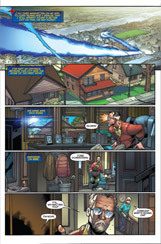 The issue is written by Gerry Duggan with art by David Baldeon. 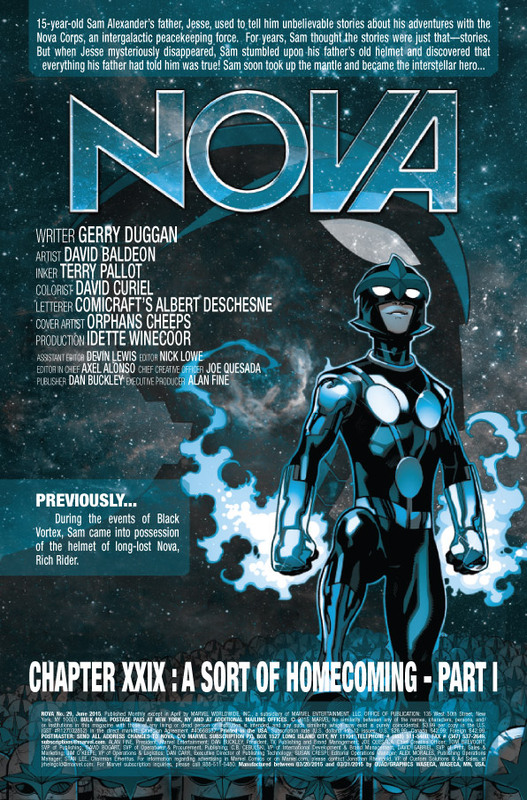 Nova #29 is scheduled to be released on April 15th. 03/27/15 Nova On The Cover Of Ultimate End #4! 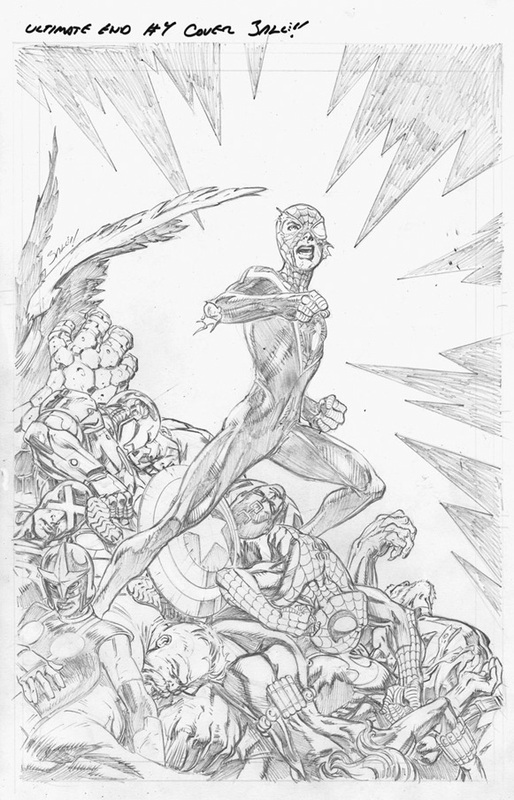 On his Tumblr page, Brian Michael Bendis revealed the cover art to Ultimate End #4. 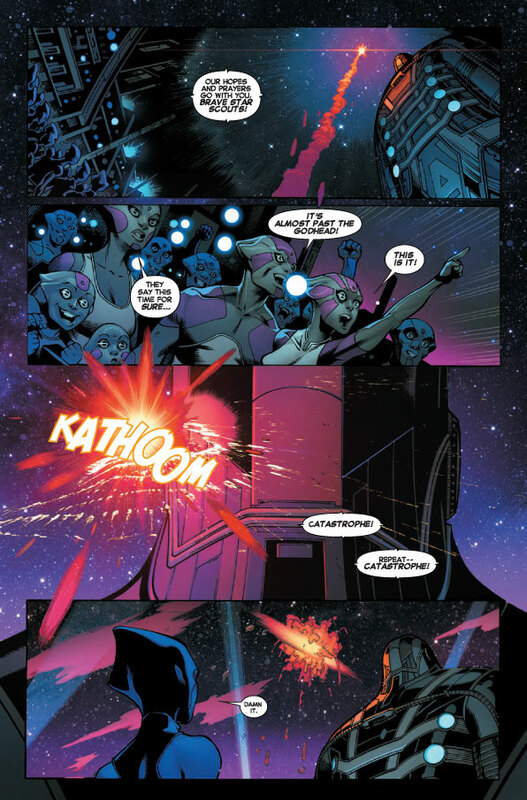 Nova can be seen in the lower left hand corner. The art is by Mark Bagley. 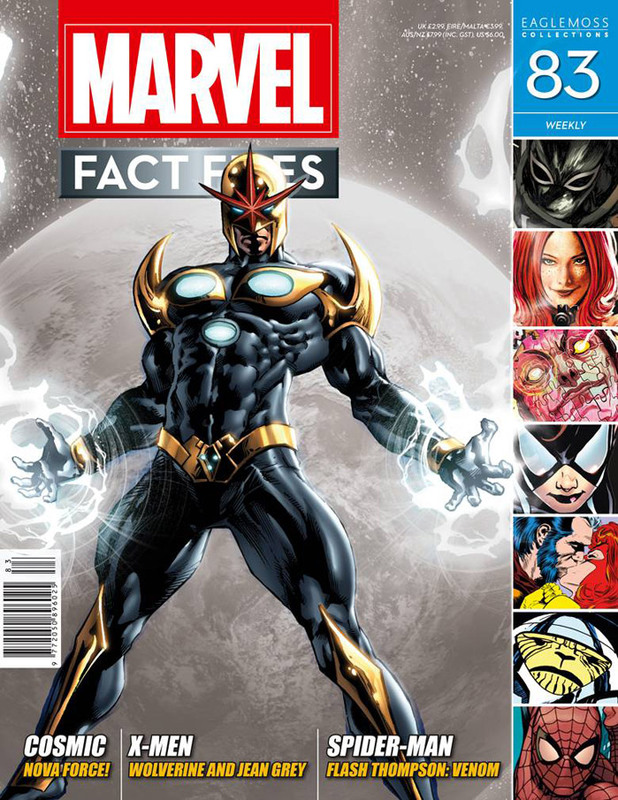 03/26/15 Nova In Marvel Fact Files #83! The United Kingdom's Eaglemoss Collections will be including Rich Rider Nova in Marvel Fact Files #83! #83 is schedule to be released in the United States on August 26th. 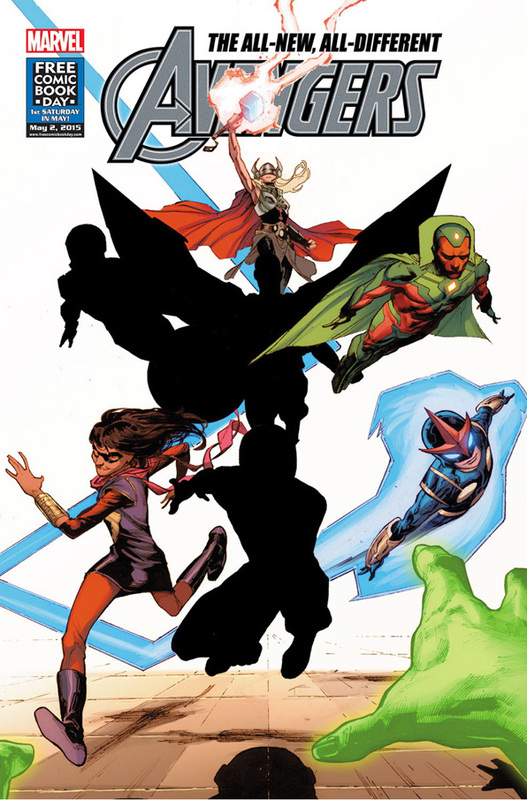 03/26/15 All-New, All-Different Avengers Creative Team! The complete All-New, All-Different Avengers team and the title's creative team have been revealed! The series will be written by Mark Waid with art by Mahmud Asrar and Laura Martin. 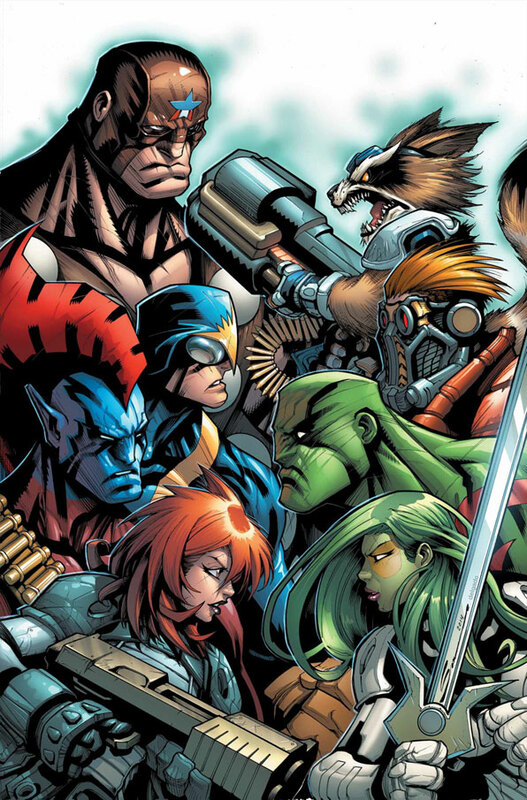 The first appearance of this group will be in the Free Comic Book Day issue of All-New, All-Different Avengers. The issue is schedule to be released on May 2nd. 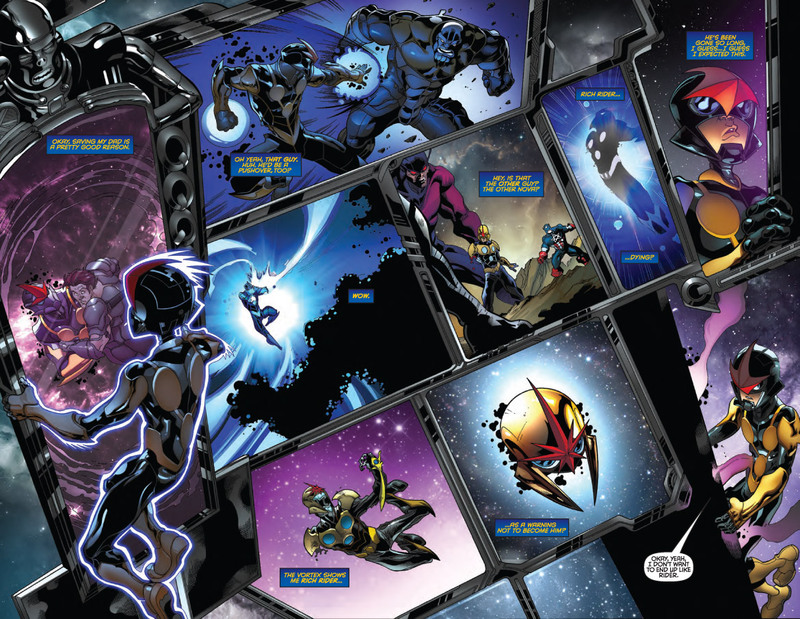 03/25/15 Nova In All-New, All-Different Avengers! 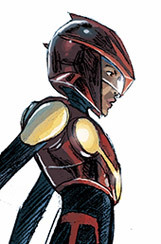 Marvel has revealed Nova as a member of the All-New, All-Different Avengers team! 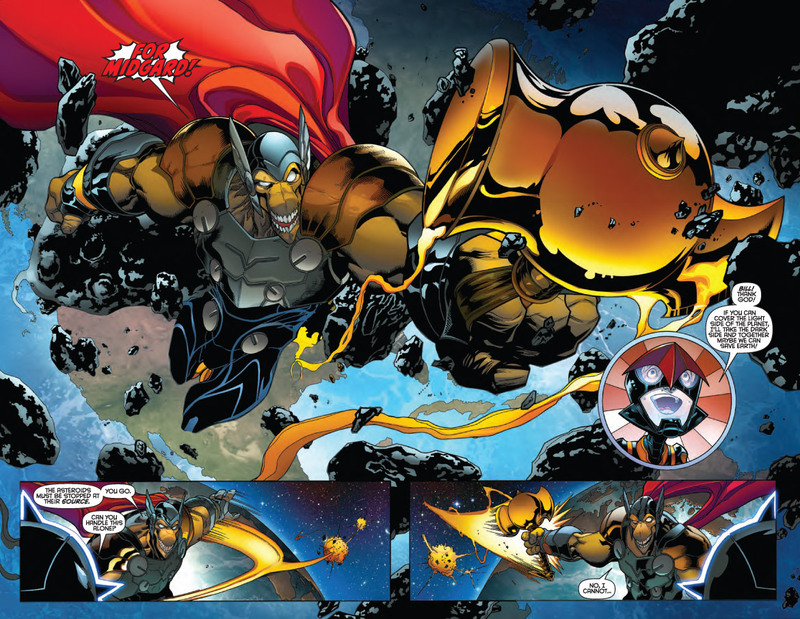 03/23/15 Infinity Gauntlet Concept Art! 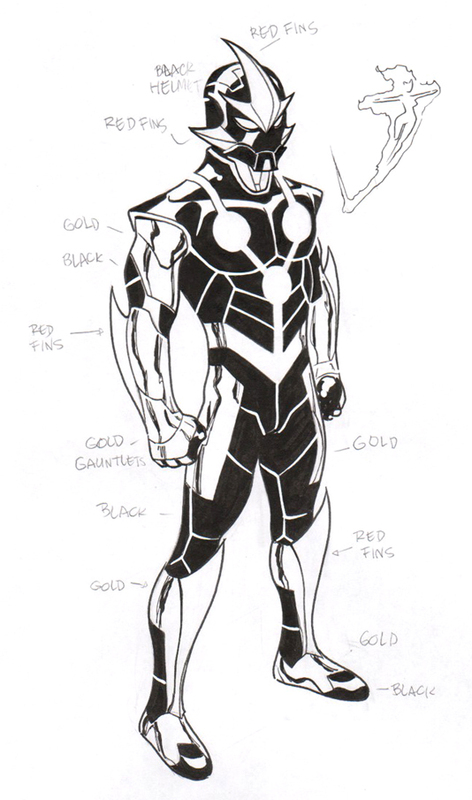 On his Tumblr page, Dustin Weaver has released some of the concept art for the upcoming Infinity Gauntlet series. 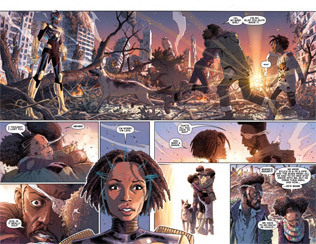 Weaver is the co-writer and artist for the series. 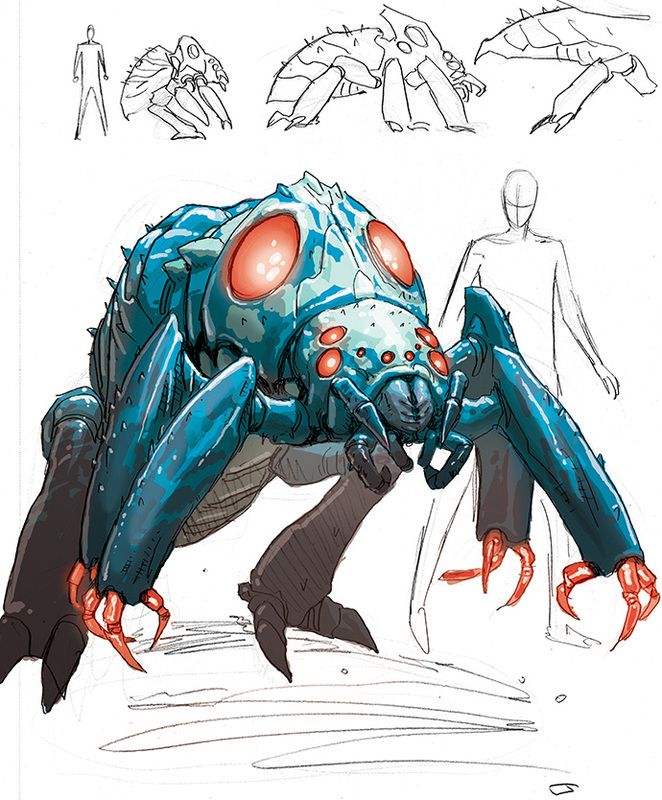 The aliens in the concept art appear to be the ones who have attacked and decimated New Xandar. Nova #27 came in at #113 with a sales estimate of 19,168! Guardians 3000 #5 came in at #119 with a sales estimate of 18,155! 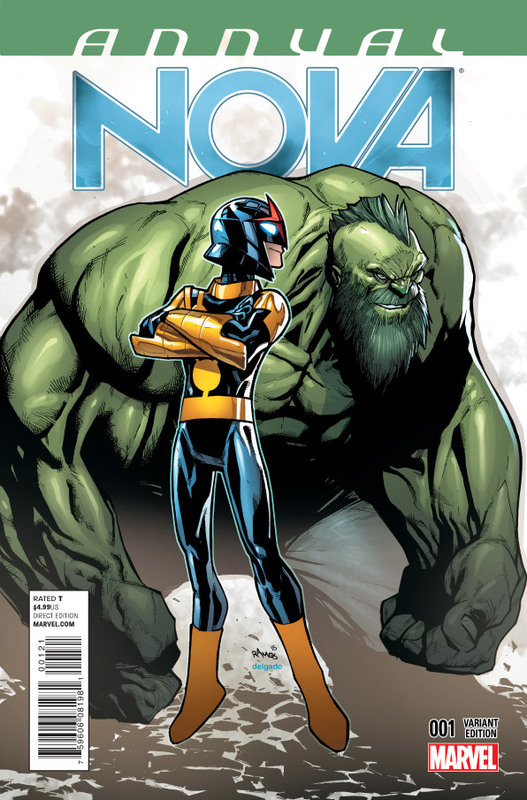 03/20/15 Nova #28 Covers & Preview Pages! Marvel has released the covers and preview pages from Nova #28! 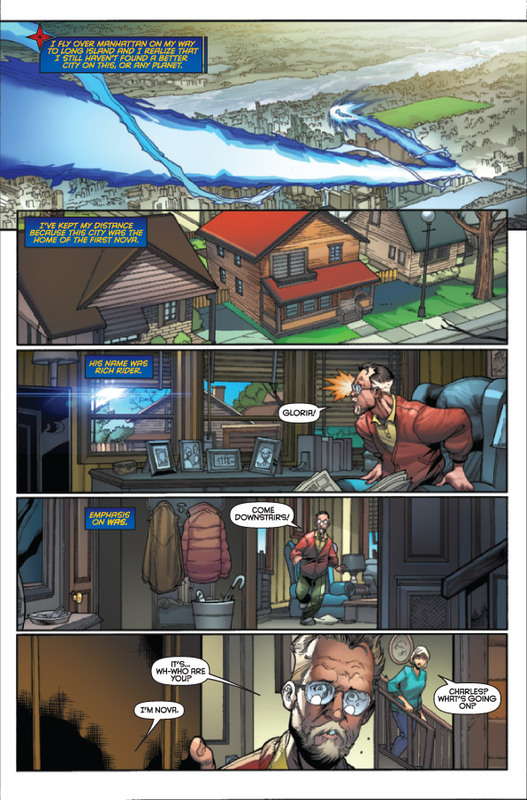 The issue is written by Gerry Duggan with art by David Baldeon. 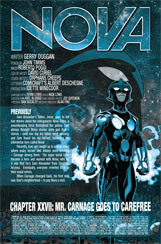 Nova #28 is scheduled to be released on March 25th. 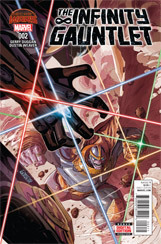 03/17/15 Infinity Gauntlet #2 Solicitation! 03/17/15 Black Vortex HC Solicitation! The Black Vortex, an ancient artifact of immeasurable power, is now in Mr. Knife's hands! 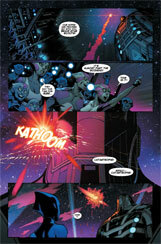 With billions of lives at stake, Star-Lord must steal it back - with the help of both the Guardians and the X-Men! But as a schism forms between the heroes, Knife's Slaughter Squad closes in! Beast and Kitty must decipher the Vortex Book as Ronan, Nova and the Brood get involved, and Spartax falls! The Vortex grants near-infinite power to Knife's forces; to counter them, the heroes will have to submit to its power themselves! 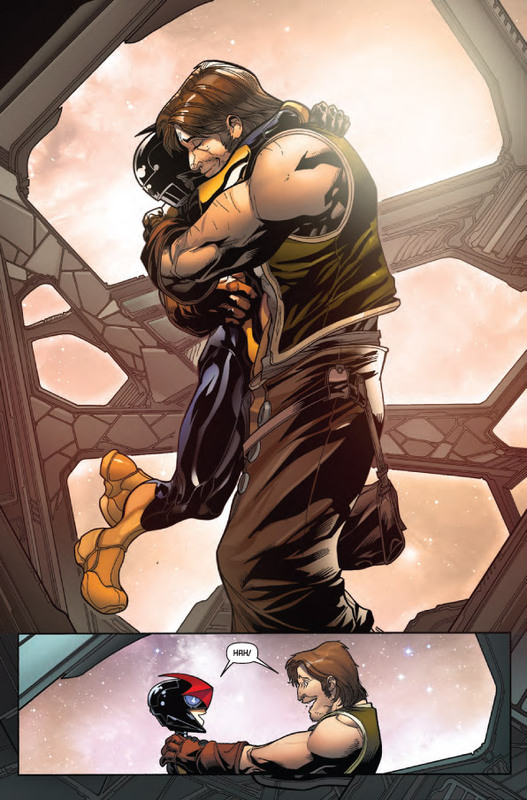 Will the X-Men and Guardians lose their humanity forever? Collecting GUARDIANS OF THE GALAXY & X-MEN: THE BLACK VORTEX ALPHA #1 and OMEGA #1, GUARDIANS OF THE GALAXY (2013) #24-25, LEGENDARY STAR-LORD #9-11, ALL-NEW X-MEN #38-39, GUARDIANS TEAM-UP #3, NOVA (2013) #28, CYCLOPS (2014) #12, and CAPTAIN MARVEL (2014) #14. 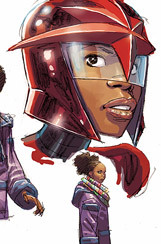 03/11/15 Nova's Helmet On Future Imperfect Cover! 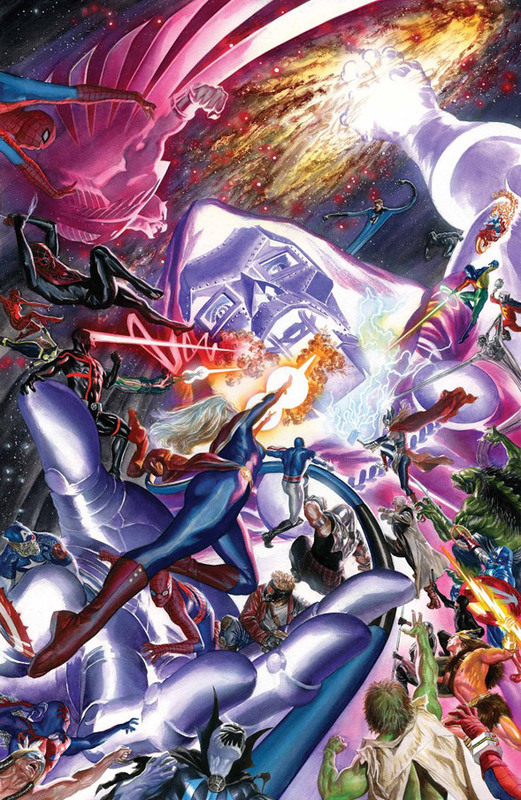 Marvel has release a teaser image for the upcoming Secret Wars Future Imperfect series. Nova's helmet can be seen in the lower right corner! 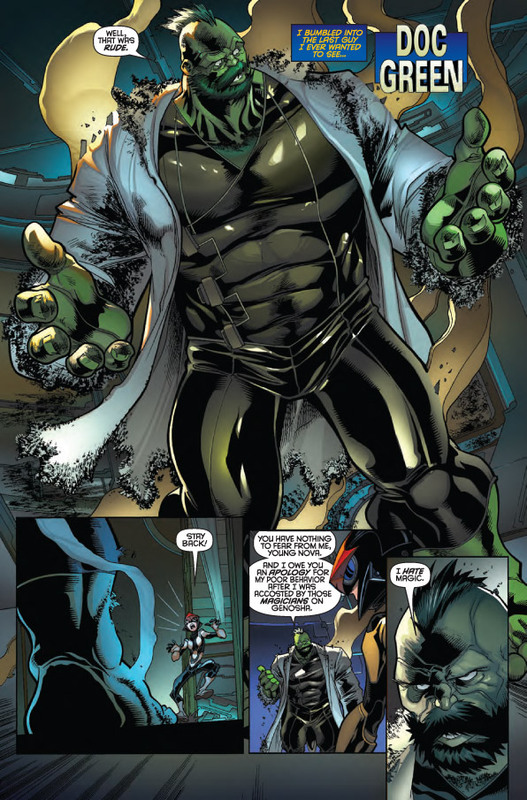 Future Imperfect is written by Peter David with art by Greg Land. It is scheduled for release on June 3rd. 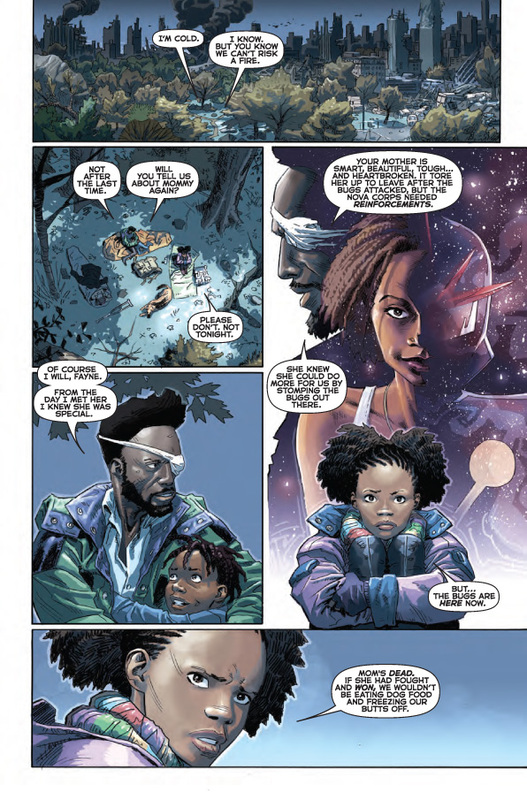 03/06/15 Nova Annual #1 Covers & Preview Pages! 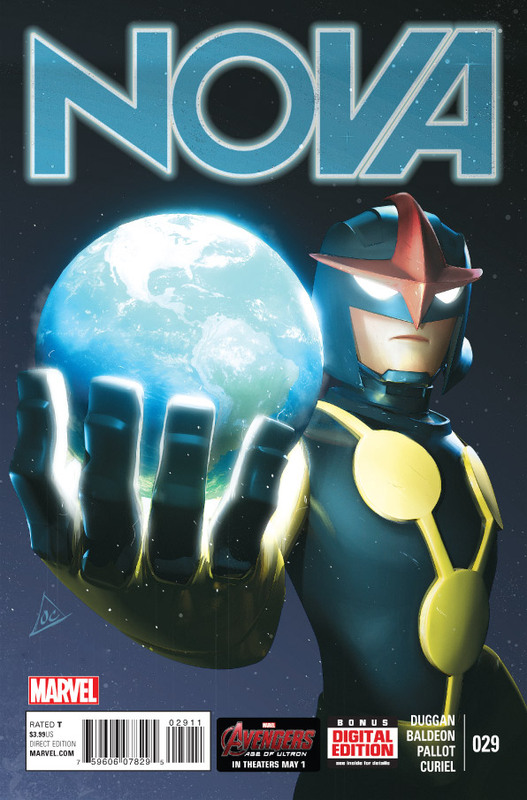 Marvel has released the covers and preview pages from Nova Annual #1! The issue is written by Gerry Duggan with art by David Baldeon. Nova Annual #1 is scheduled to be released on March 11th. 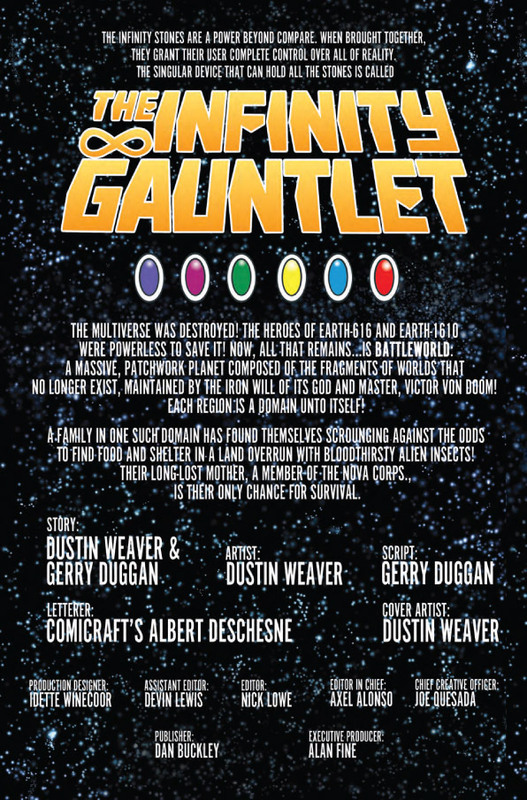 02/19/15 Infinity Gauntlet Press Release! The stones are calling to one another, and the most powerful artifact in the universe will be re-assembled in INFINITY GAUNTLET #1! 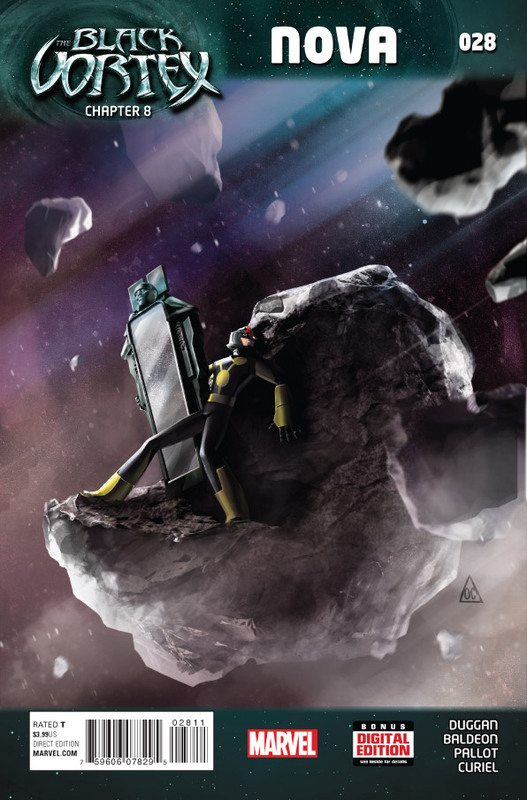 A brand new Secret Wars series launching this May, Gerry Duggan (Deadpool, Nova) and Dustin Weaver (Edge of Spider-Verse) bring you a cosmic tale of life, death and the things we do for survival. 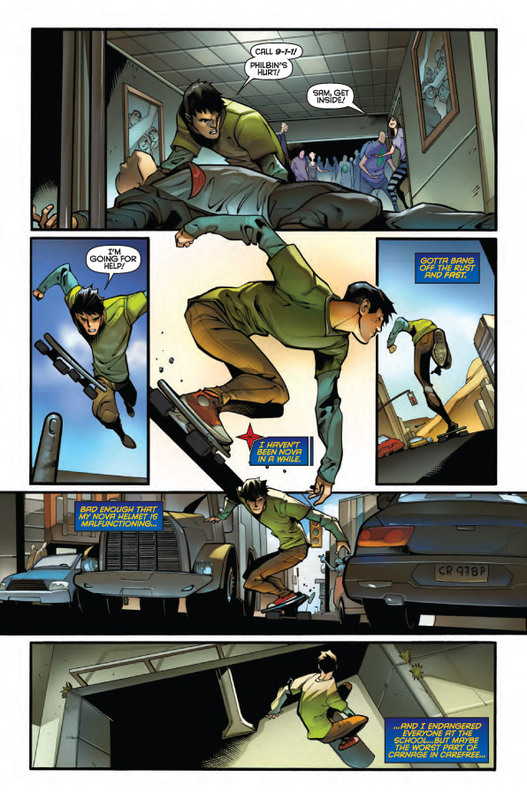 "Editor Nick Lowe had discussed a family of Novas, and Dustin had some pretty spectacular ideas on the way in the door," says Gerry Duggan in an interview with Marvel.com. "It's a unique opportunity to showcase a family of survivors dealing with an alien invasion that was devastatingly successful." 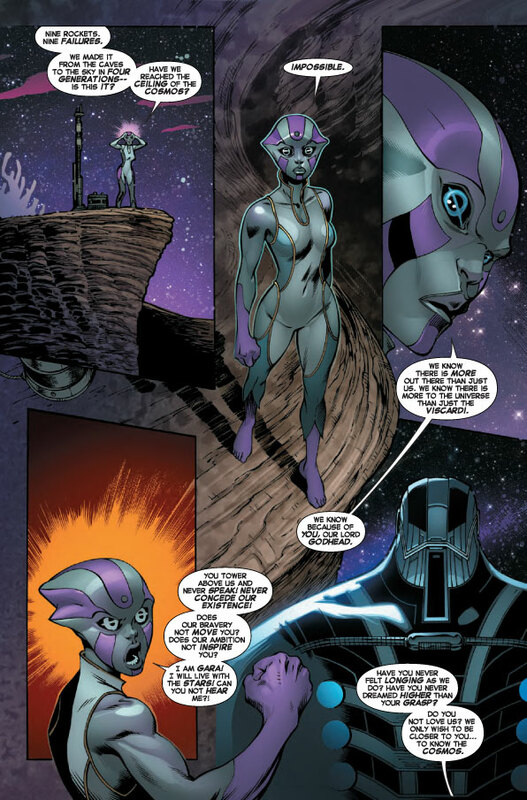 Welcome to New Xandar, in the southern hemisphere of Battleworld. Once a beautiful city-state, an invasion from a neighboring zone has left it a barren post-apocalytpic mess. In this hellish wasteland, Anwen Bakian and her family struggle and claw to survive. 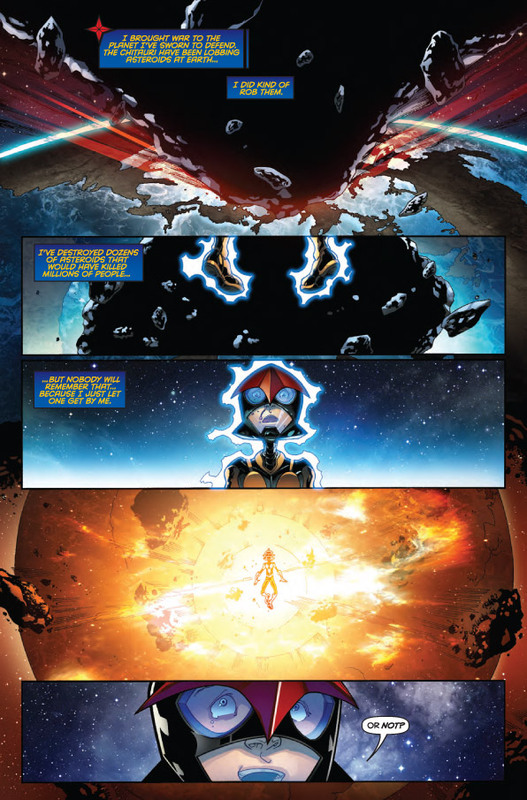 Mom left years ago to join the Nova Force, and never came back. 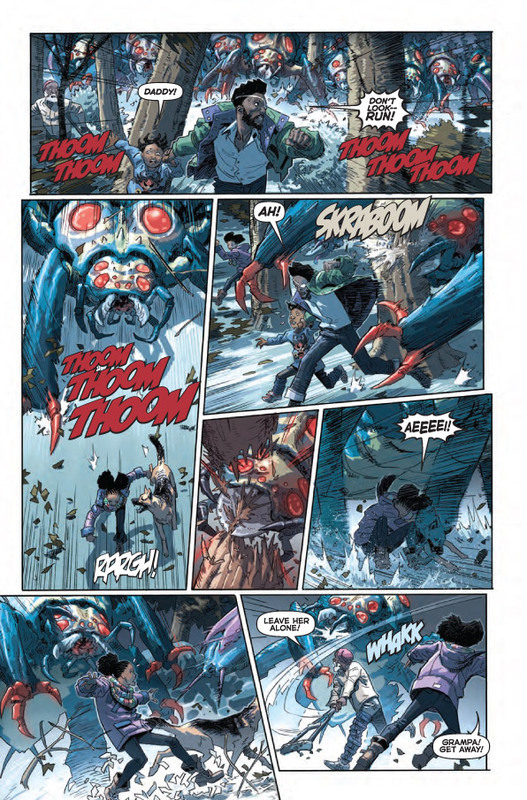 Now it's just her, her dad, sister and grandfather - all alone in a realm dominated by giant killer insects. That is, until she finds a mysterious stone that may or may not unlock incredible cosmic power. Only, now she will find herself being hunted by those who seek the stone for their own - including the madman known as Thanos! 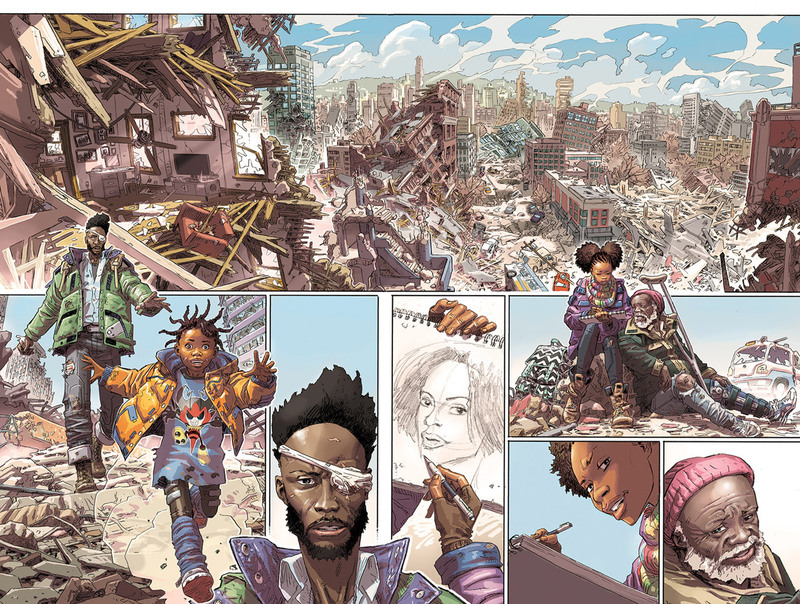 "If you want to see the most imaginative story and story-telling in comics," says Senior Editor Nick Lowe, "you better pick up INFINITY GAUNTLET." A hero's journey like you've never seen before begins this May. 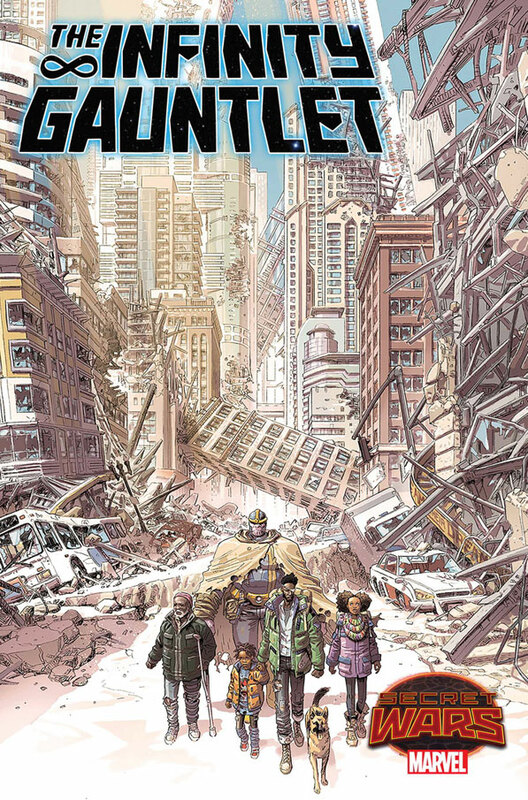 Don't miss the start of an incredible new series from Duggan and Weaver that will flip the cosmic side of the Marvel Universe on its ear when the gauntlet is reborn in INFINITY GAUNTLET #1! 02/17/15 Infinity Gauntlet #1 Solicitation! Think your life is hard? Anwen Bakian's family lives in a post-apocalyptic wasteland, scrounging for food and avoiding giant bugs intent on eating them. 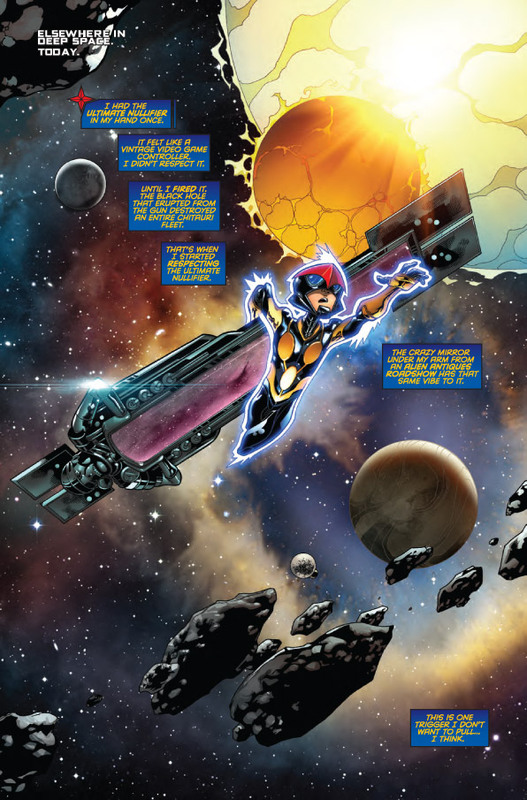 Mom left years ago to join the Nova force and never came back. So it's just Anwen, her dad, her sister and her grandpa against the huge insects. That is, until she finds a mysterious stone that may or may not hold incredible cosmic power. 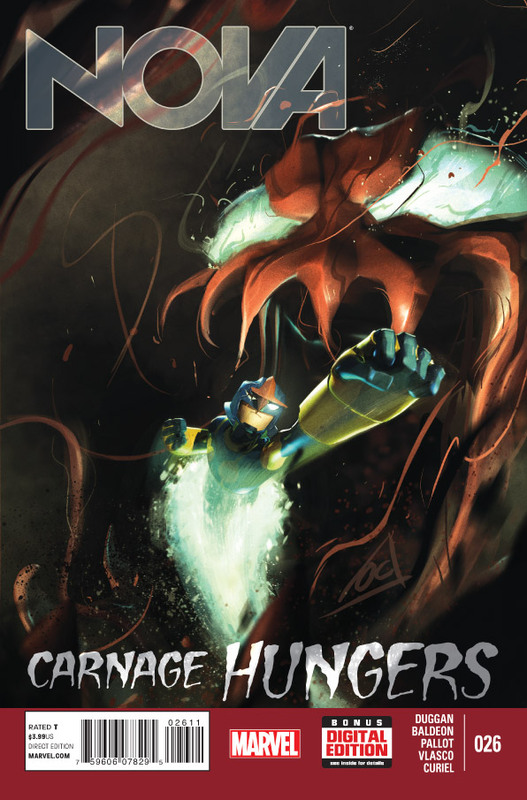 Don't miss this incredible new series by DEADPOOL writer Gerry Duggan and EDGE OF SPIDER-VERSE writer/artist Dustin Weaver that will set the cosmic table for the Marvel Universe for years to come! The world is under threat and it's up to Sam Alexander, A.K.A. Nova, and his friends Beta Ray Bill, Doc Green, the Guardians of the Galaxy and Cosmo to save the planet. You won't believe the end of this issue! Guardians 3000 #4 came in at #106 with a sales estimate of 20,318! Nova #26 came in at #112 with a sales estimate of 19,639! 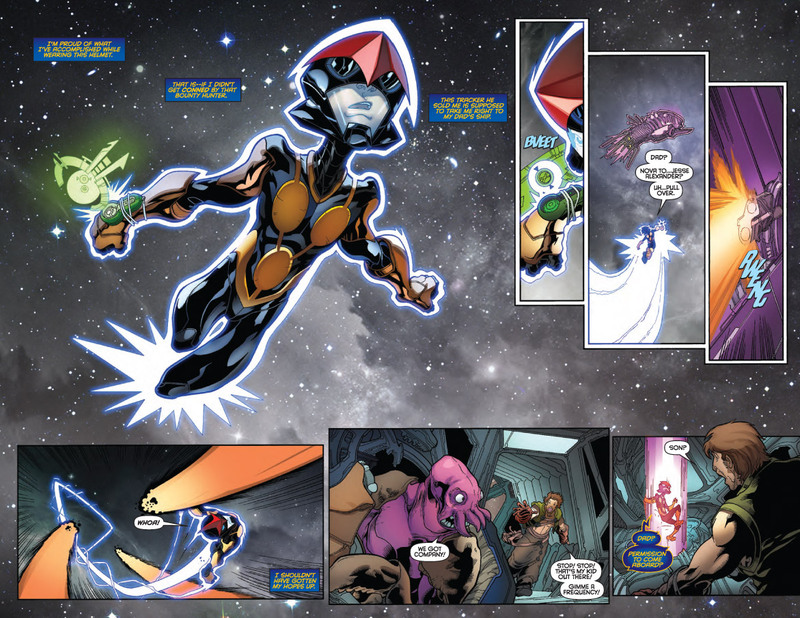 02/17/15 New Nova In Infinity Gauntlet Series! 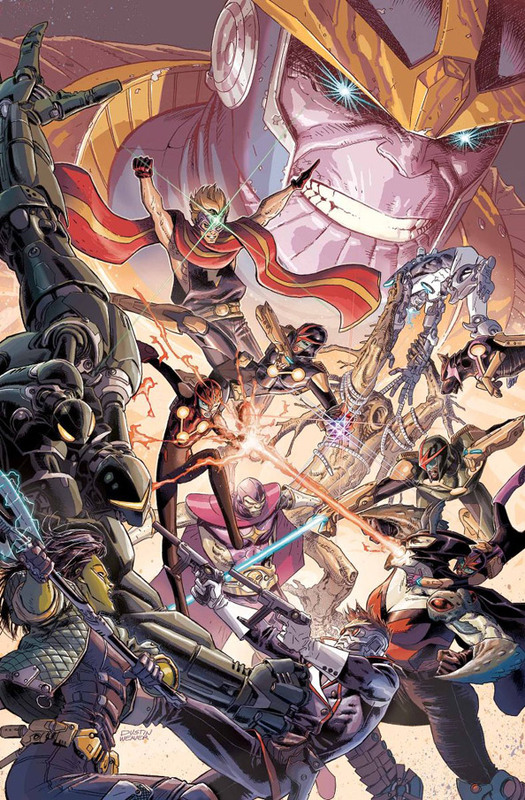 Marvel has released concept art and info about a new Infinity Gauntlet series to be released after the Secret Wars event. 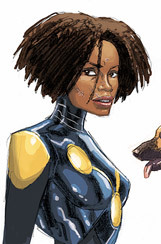 The series will include a new Nova named Anwen Bakian. Bakian lives with her father, sister and grandfather in a post-apocalyptic wasteland and finds a cosmic stone which changes their lives. 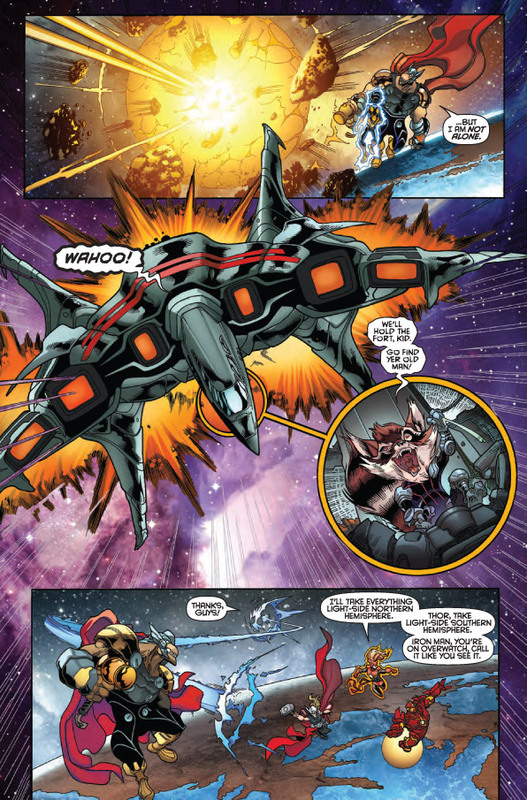 The Bakians appear to become a family of Novas with different colored armors. The grandfather in green, the father in blue, Anwen in red and her sister in purple. The Infinity Gauntlet series will be written by Gerry Duggan and Dustin Weaver. The artist for the series and the concept art is Dustin Weaver. Art and info is courtesy of the LA Times' Hero Complex. 02/14/15 Hasbro Reveals Nova Super Hero Masher! At Toy Fair 2015, Hasbro revealed a number of new figures. One of them is the Nova Super Hero Masher!! 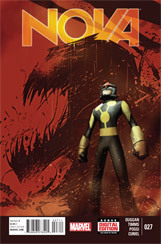 The figure is of Richard Rider in his Nova Prime uniform. The figure is expected to be released this fall. 02/13/15 Nova #27 Cover & Preview Pages! 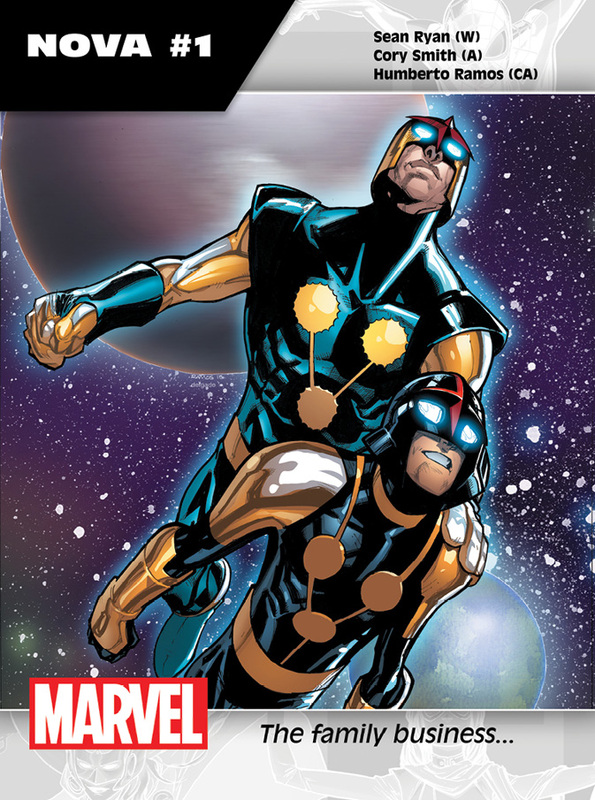 Marvel has released the cover and preview pages from Nova #27! 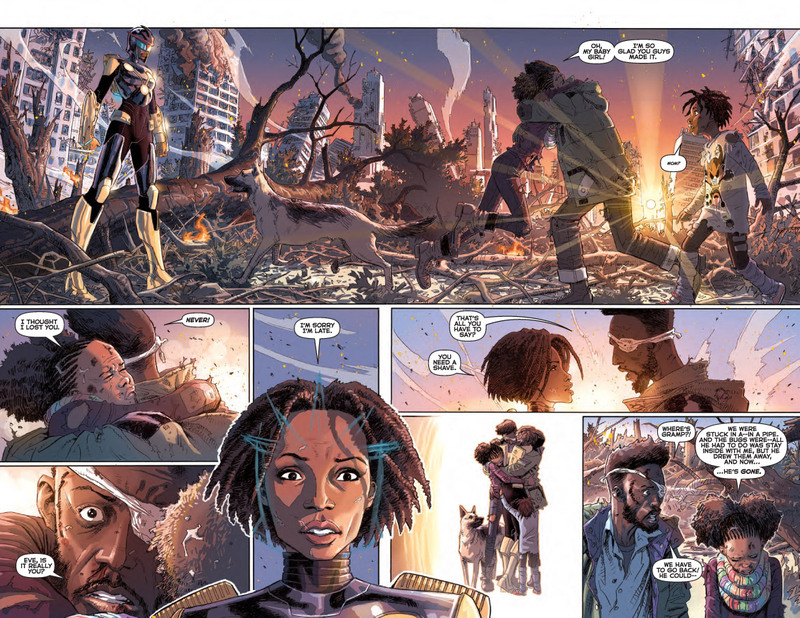 The issue is written by Gerry Duggan with art by John Timms. 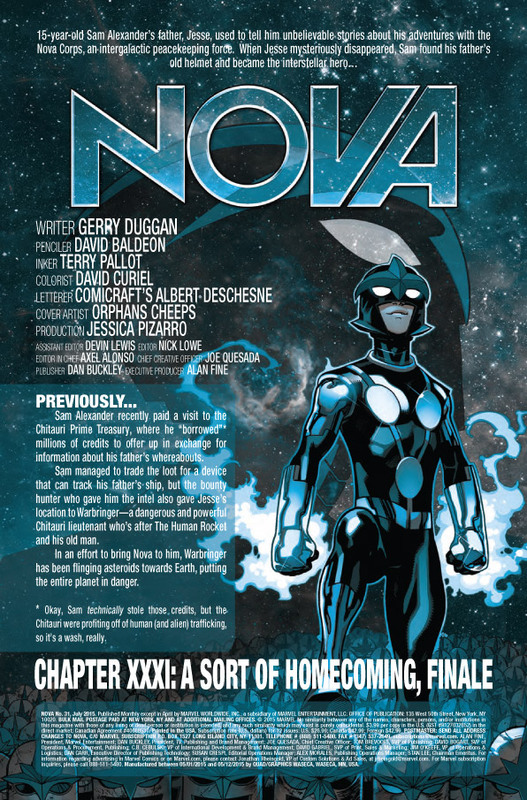 Nova #27 is scheduled to be released on February 18th. 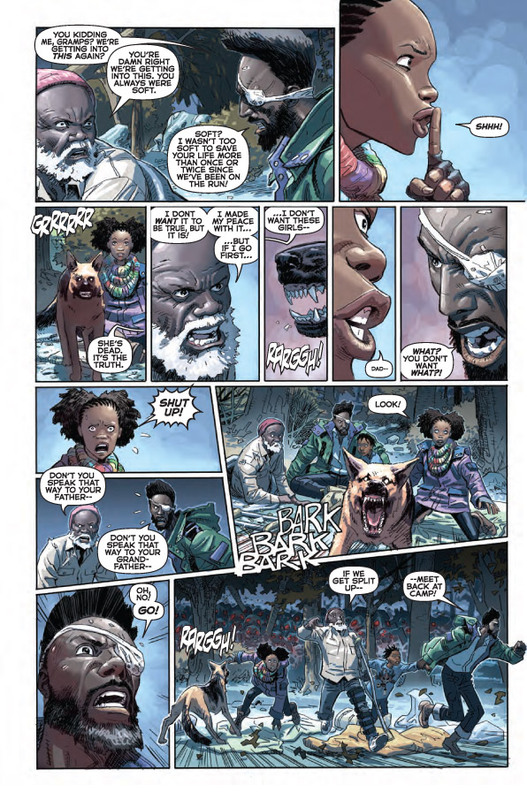 01/30/15 Black Vortex: Alpha Covers & Preview Pages! 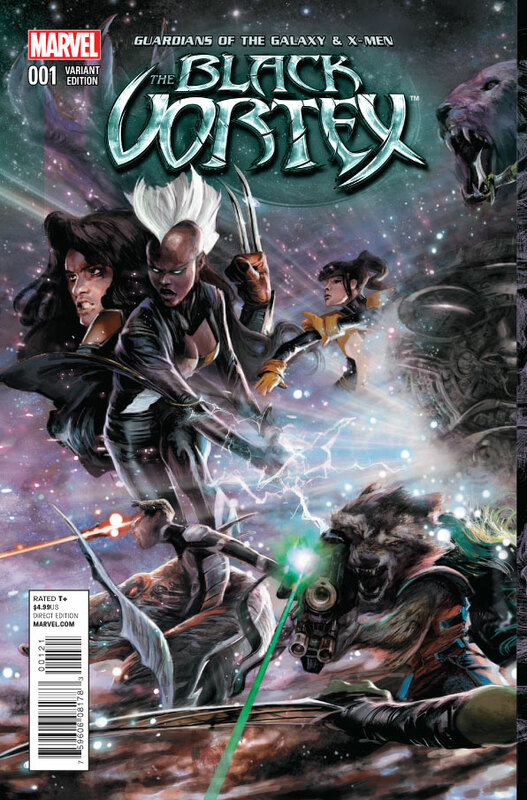 Marvel has released the cover and preview pages from Black Vortex: Alpha #1! The issue is written by Sam Humphries with art by Ed McGuinness. 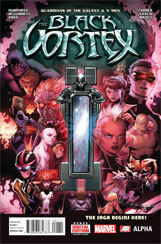 Black Vortex: Alpha #1 is scheduled to be released on February 4th. 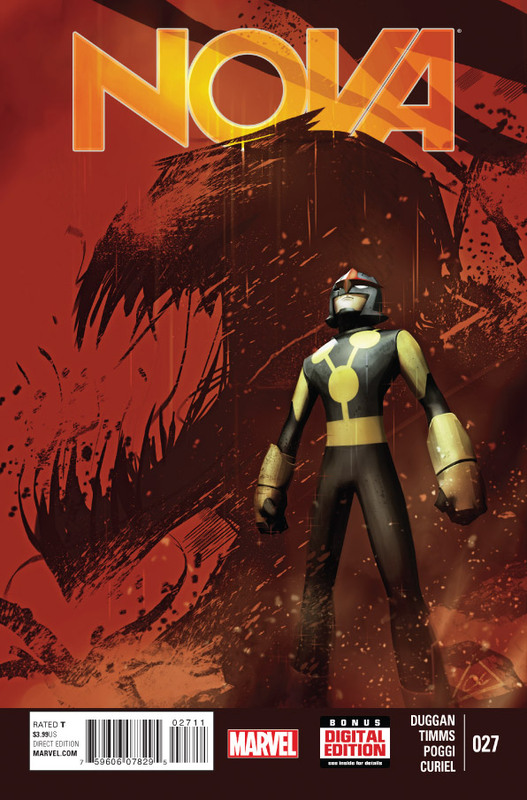 01/23/15 Nova #26 Cover & Preview Pages! 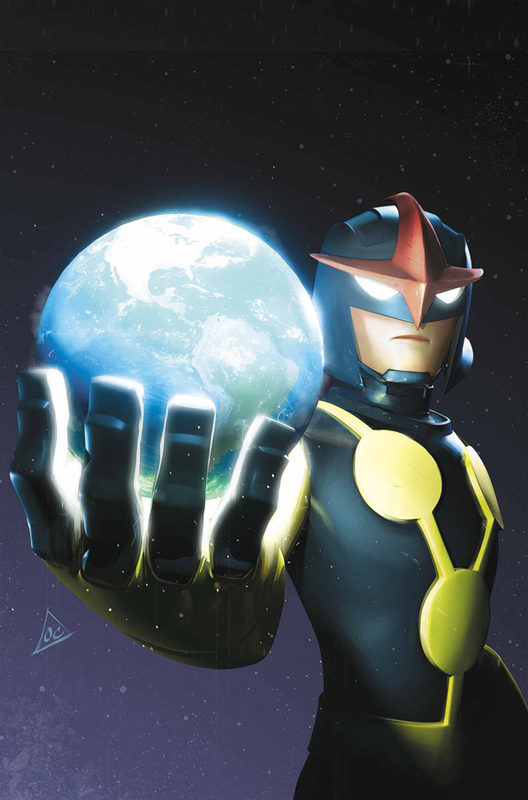 Marvel has released the cover and preview pages from Nova #26! 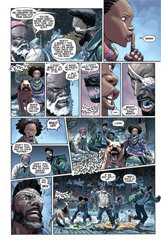 The issue is written by Gerry Duggan with art by John Timms. Nova #26 is scheduled to be released on January 28th. Guardians 3000 #3 came in at #100 with a sales estimate of 25,509! Nova #25 came in at #116 with a sales estimate of 21,805! 01/19/15 Nova #29 & #30 Solicitations! 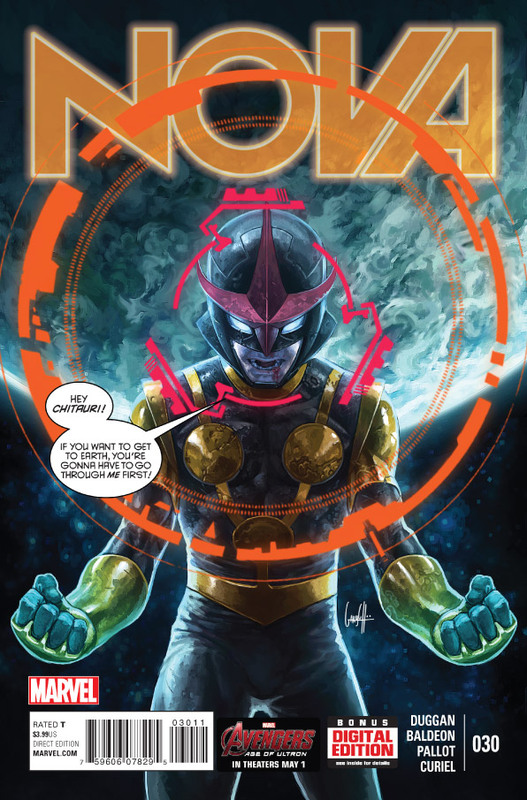 Hot out of the Black Vortex Crossover, Nova is back on Earth! But problems have followed him back to Earth and this arc will test Sam more than anything ever has before. 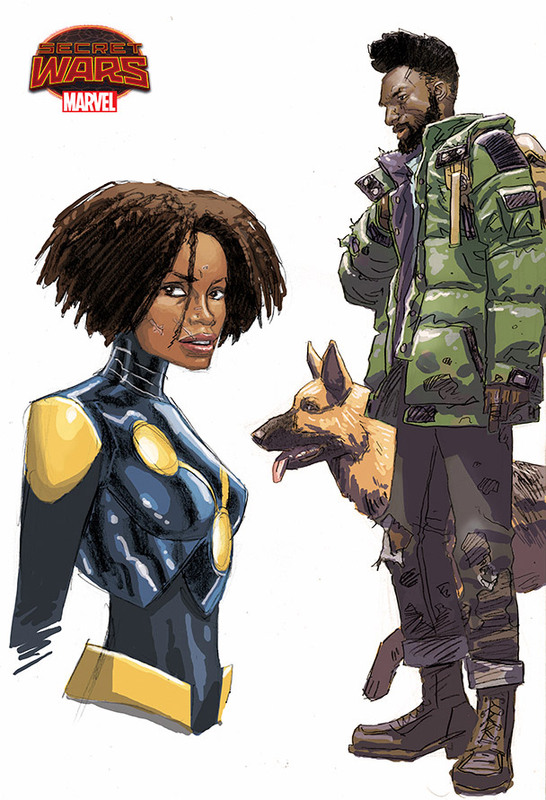 01/19/15 Black Vortex: Omega #1 Solicitation! THE BLACK VORTEX ENDS HERE! 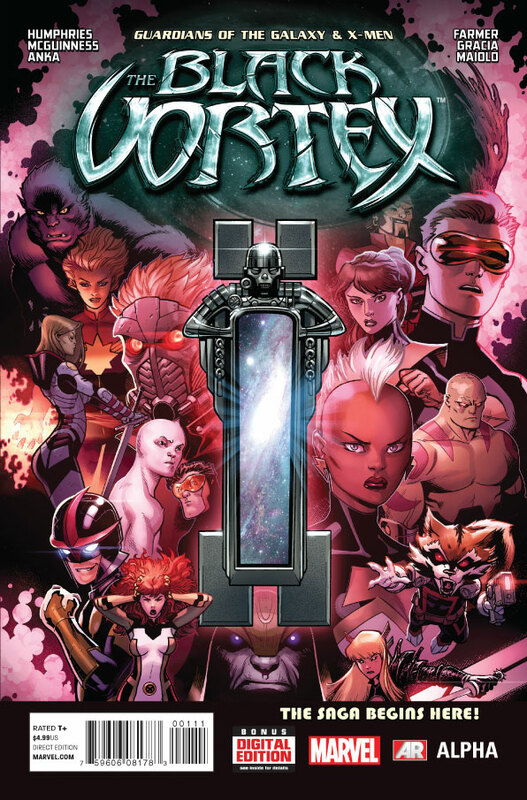 When an entire planet, and potentially the entire galaxy, is caught in the crosshairs of Knife's cosmically empowered forces, the Guardians and the X-Men face their final test. With billions of lives at stake, our heroes are forced to make the ultimate sacrifice. But in gaining the power to potentially defeat Knife, by submitting to the Black Vortex, could they have given up their humanity forever? 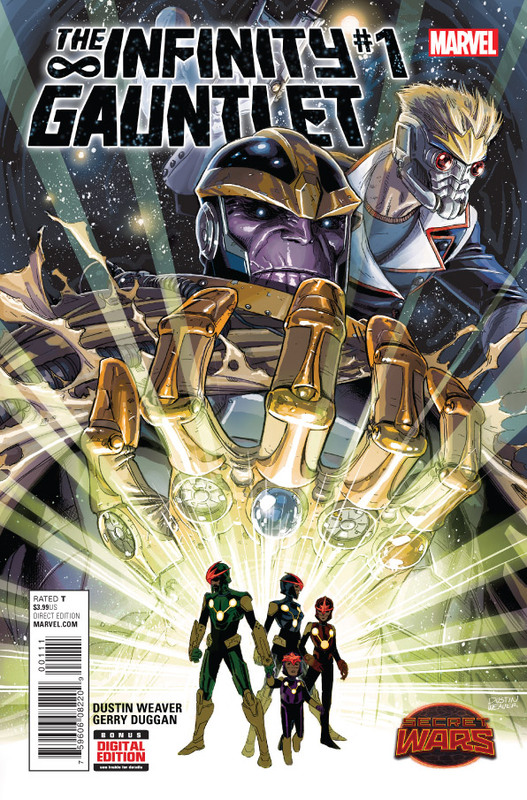 01/19/15 Guardians 3000 #7 Solicitation! 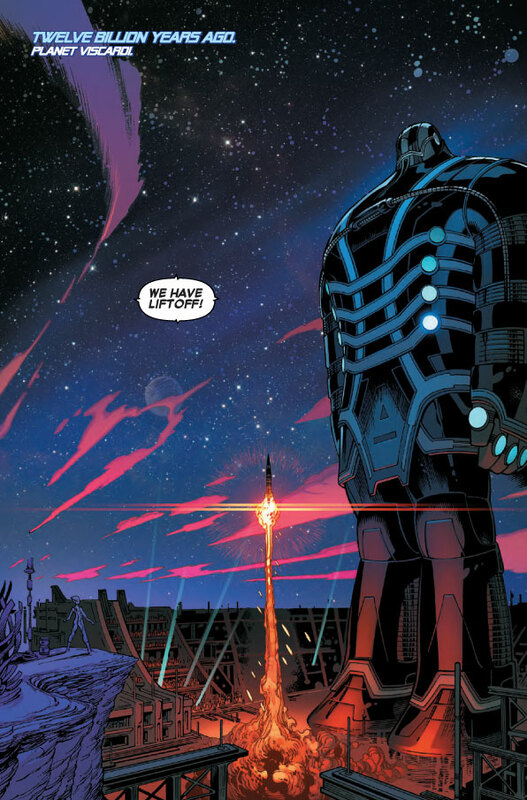 Welcome to 21st Century Earth, Guardians. Meet... The Guardians of the Galaxy! The Guardians meet the Guardians... what could POSSIBLY go wrong? 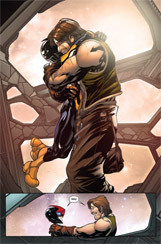 Guest starring Rocket Raccoon, Groot, Drax, Gamora, Star-Lord... and Star-Lord... and... time-travel craziness! 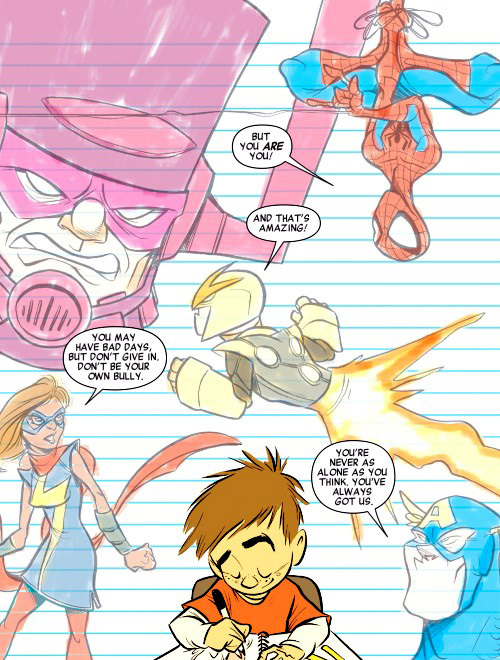 01/15/15 Nova Drawing In Avengers: No More Bullying! Sam Alexander Nova appears as a drawing in a boy's notebook in Avengers: No More Bullying #1. The issue went on sale January 7th. Special thanks to Tom Brennan for the heads-up! 01/08/15 McGuinness's Black Vortex CE Nova Design! Marvel has released a look at Ed McGuinness's design for the Cosmically Enhanced Nova! This version of Sam Alexander will be appearing in the Black Vortex cosmic event. 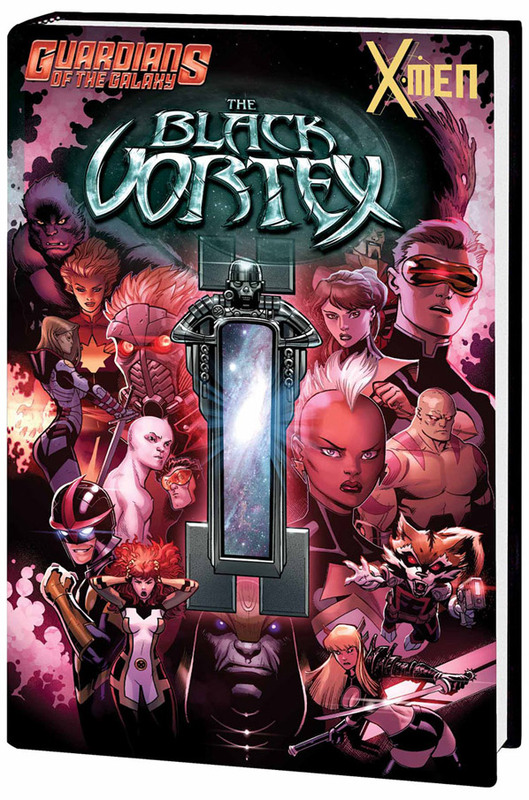 Black Vortex launches with The Black Vortex Alpha #1 scheduled to be released on February 4th! 01/06/15 Sign The Return Rich Rider (R3) Petition! If you would like to see the return of Rich Rider as Nova Prime (and who wouldn't!? ), now's a chance to let your voice be heard! The Return Rich Rider (R3) Petition has been added to the right side of the site. Feel free to sign the petition and it will be forwarded to Marvel at a later date! The question was: "GotG's Original Sin/Rich Rider arc?" 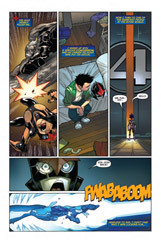 06/30 Added Nova #1 info to News. 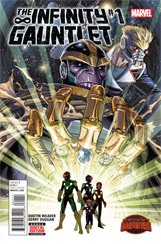 06/29 Added Infinity Gauntlet section to Issues. 06/25 Added Avengers press release to News. 06/24 Added Avengers promo art to News. 06/19 Added previews for Inf. Gauntlet #2 to News. 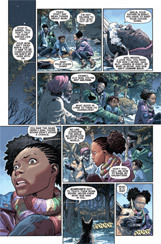 06/19 Added Secret Wars #7 to News. 06/08 Added Nova #31 summary to Nova 2013. 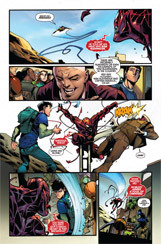 06/04 Added Renew Your Vows #1 to News. 05/28 Added April sales info to News. 05/28 Added Marvel Fact Files #91 to News. 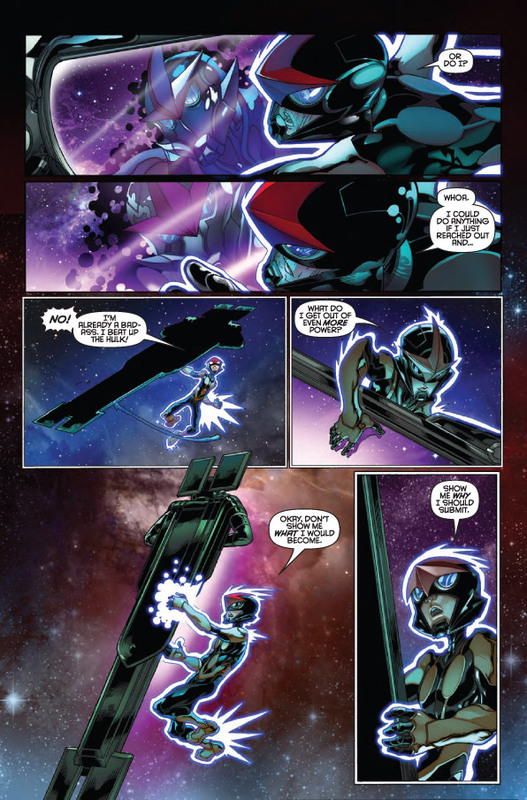 05/22 Added previews for Nova #31 to News. 05/22 Added previews for Inf. Gauntlet #1 to News. 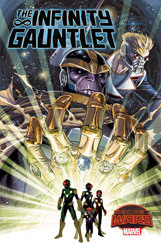 05/19 Added Infinity Gauntlet #4 solicit to News. 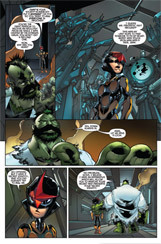 05/13 Added Nova #30 summary to Nova 2013. 05/04 Added March sales info to News. 04/30 Added IG #1 press release to News. 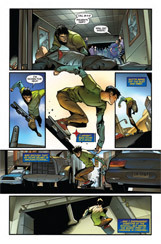 04/24 Added previews for Nova #30 to News. 04/23 Added Phil Hester sketch to Sketches. 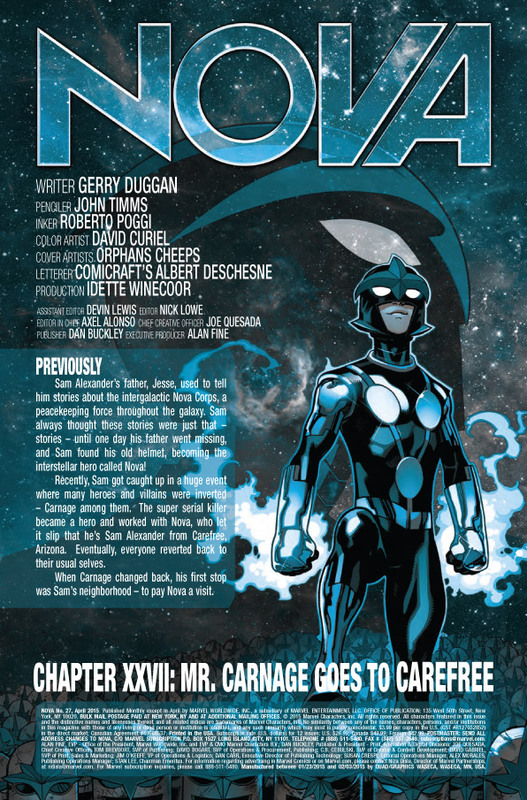 04/22 Added Nova #29 summary to Nova 2013. 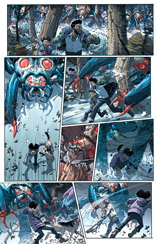 04/21 Added July solicitations to News. 04/10 Added previews for Nova #29 to News. 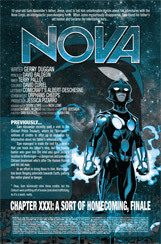 04/09 Added Nova 619 Guide to FanWorks. 03/27 Added Ultimate End #4 to News. 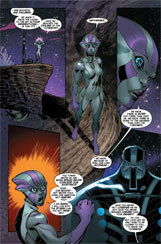 03/27 Added Nova #28 summary to Nova 2013. 03/26 Added Marvel Fact Files #83 to News. 03/26 Added more Avengers info to News. 03/25 Added Avengers info to News. 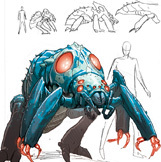 03/23 Added IG concept art to News. 03/20 Added February sales info to News. 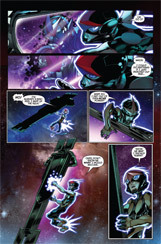 03/20 Added previews for Nova #28 to News. 03/17 Added June solicitations to News. 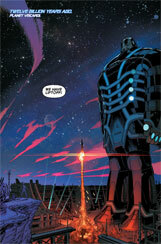 03/13 Added Annual #1 summary to Nova 2013. 03/11 Added Future Imperfect to News. 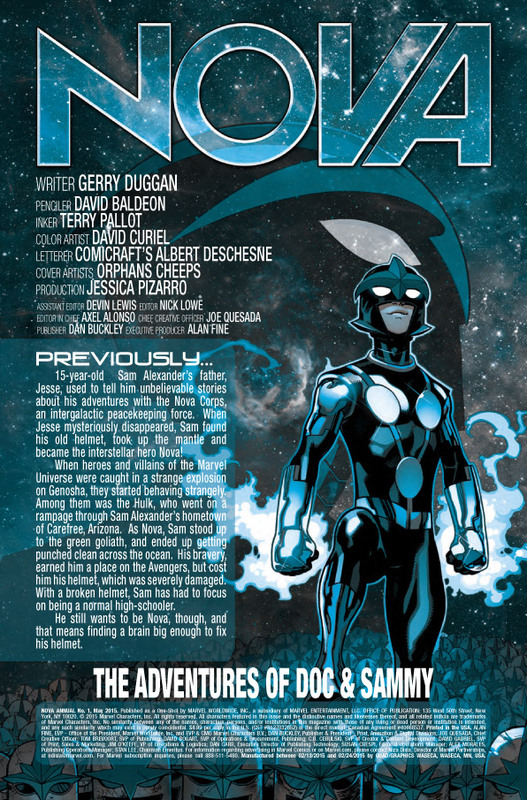 03/11 Added Nova #27 summary to Nova 2013. 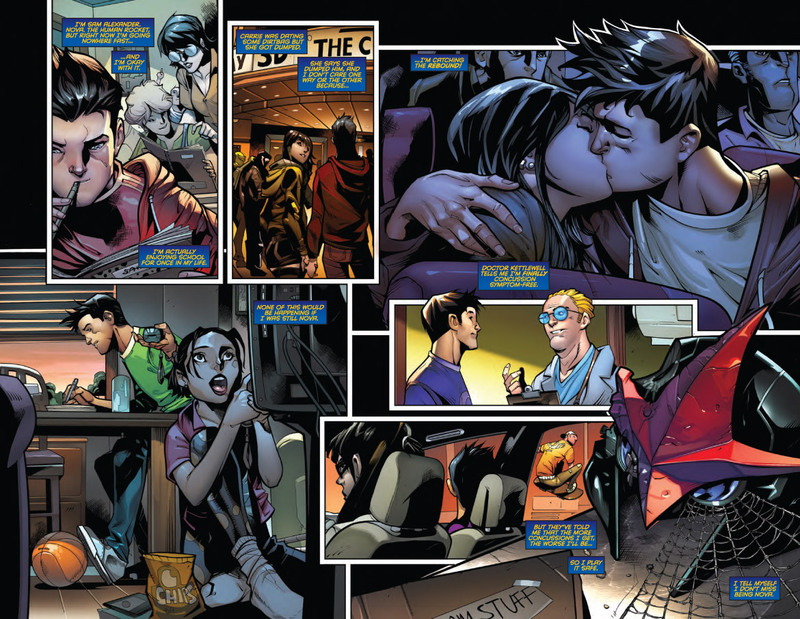 03/06 Added previews for Annual #1 to News. 02/19 Added IG Press Release to News. 02/17 Added May solicitations to News. 02/17 Added January sales info to News. 02/17 Added SW Infinity Gauntlet to News. 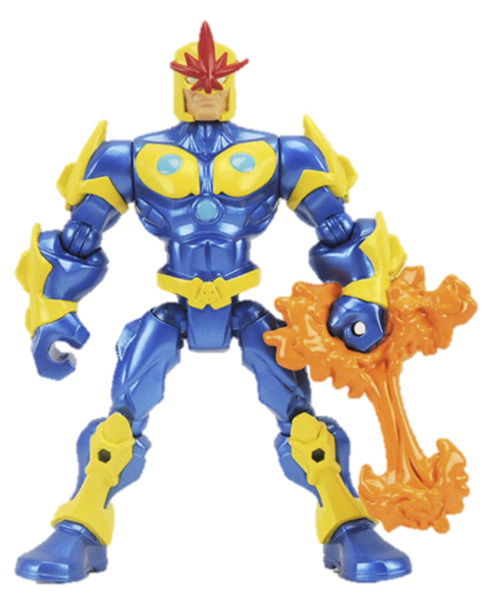 02/14 Added Hasbro's Nova Masher to News. 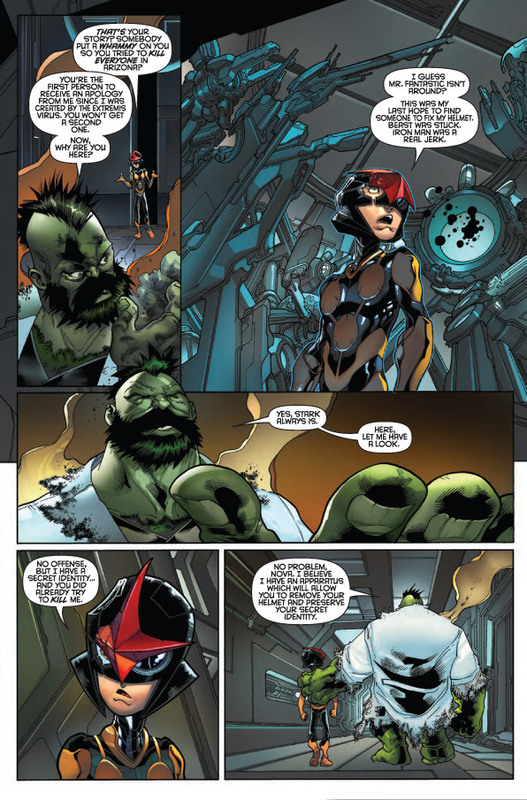 02/13 Added previews for Nova #27 to News. 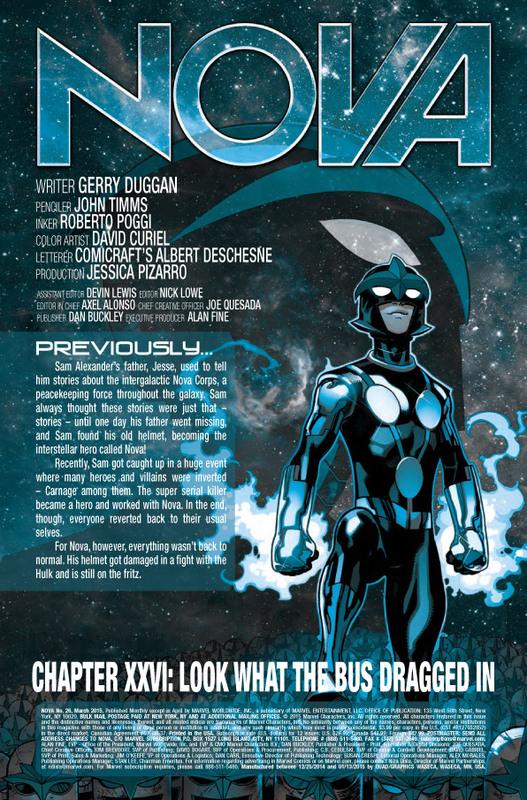 02/12 Added Nova #26 summary to Nova 2013. 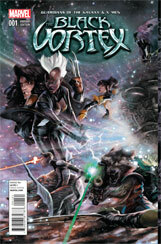 01/30 Added previews for Black Vortex #1 to News. 01/23 Added new fan fiction to FanWorks. 01/23 Added previews for Nova #26 to News. 01/19 Added December sales info to News. 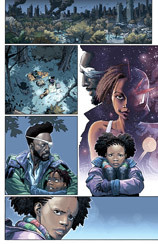 01/19 Added April solicitations to News. 01/15 Added Avengers: NMB #1 to News. 01/08 Added CE Nova design to News. 01/06 Added R3 Petition to the site. 01/06 Changed poll/posted results to News.